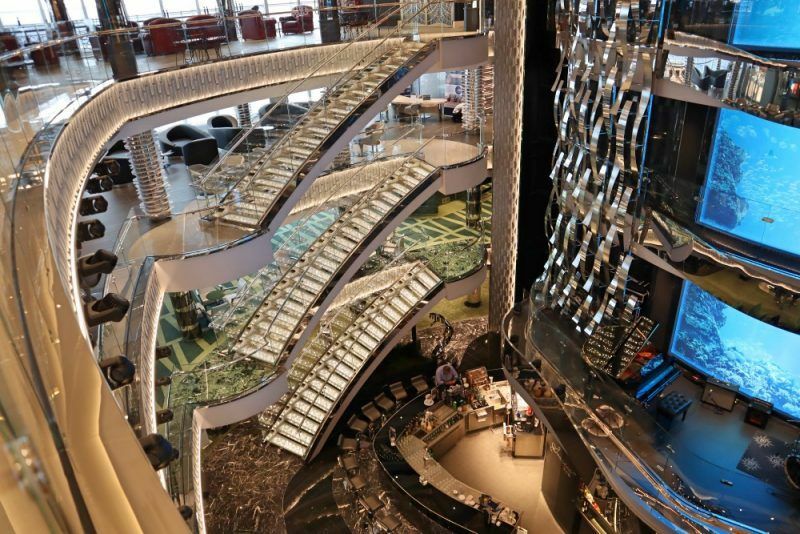 Here’s our review and guide to cruising on MSC Cruises new ship – the MSC Seaview, launched in June 2018. 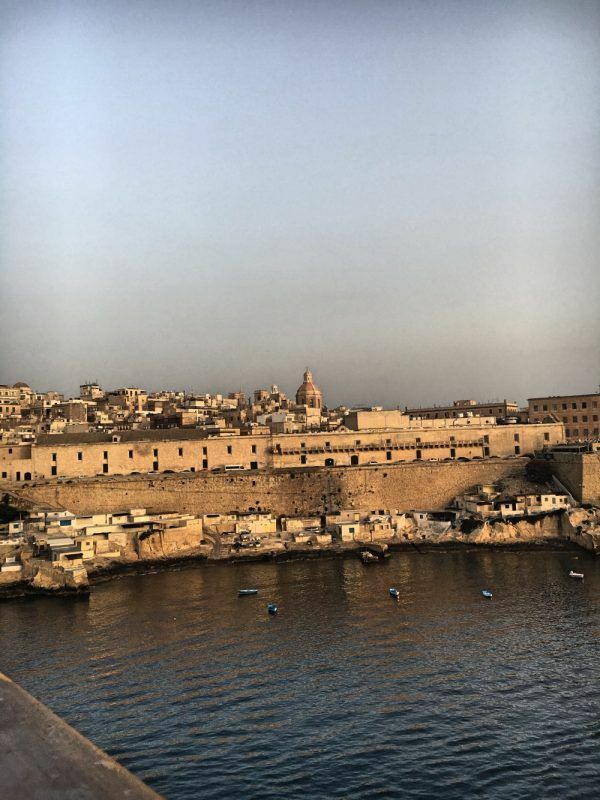 We took a one week cruise around the Mediterranean in July, taking in the ports of Genoa, Naples and Messina in Italy, Valetta in Malta, Barcelona in Spain and Marseilles in France. 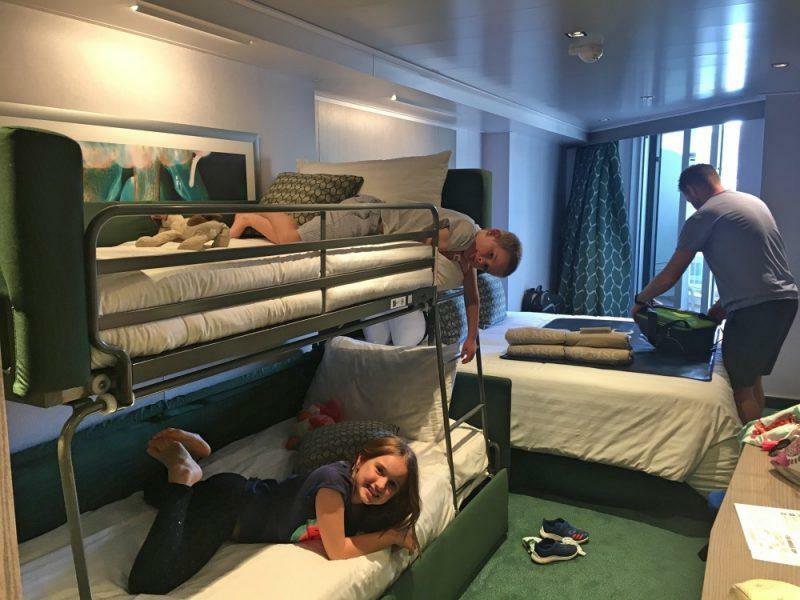 We took a four-berth family cabin in the MSC cruise line Fantastica class, which we booked via the MSCOnline website. 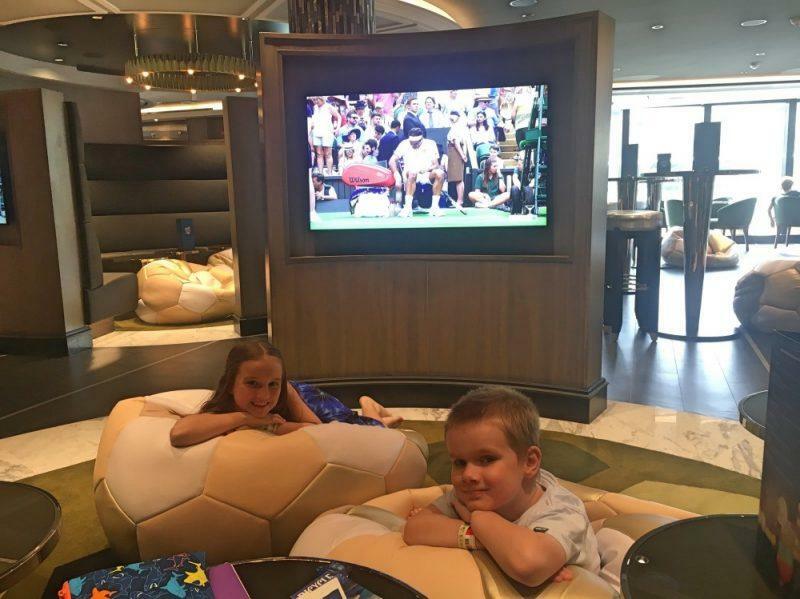 This MSC Seaview review details everything you need to know about a family holiday on an MSC Mediterranean cruise. 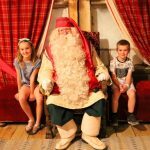 NEW: We’ve learned how to save hundreds on shore excursions – click here to find out how you can too! 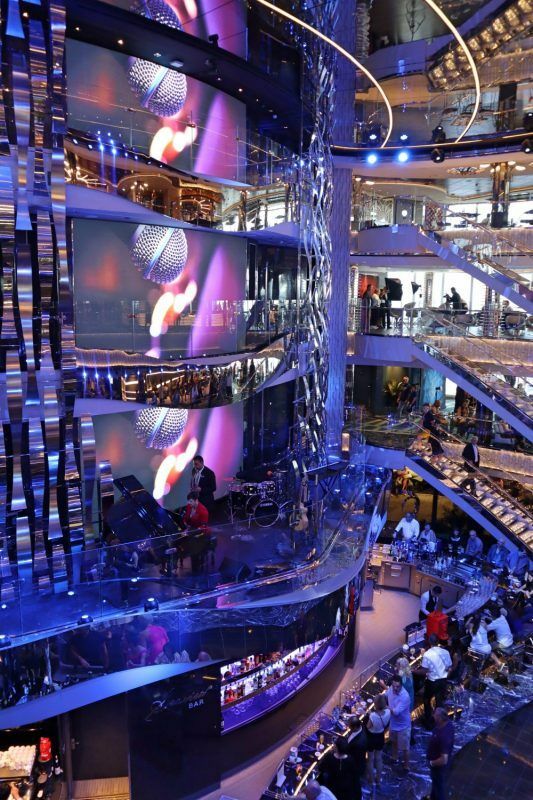 MSC cruise ships newest vessel is massive – while not the biggest cruise ship in the world or even the biggest MSC cruise ship, it’s the largest ship ever built in Italy. The ship can holds 4,000 passengers, is over 1,000 feet long, 20 stories high and has 1,400 crew taking care of the passengers. 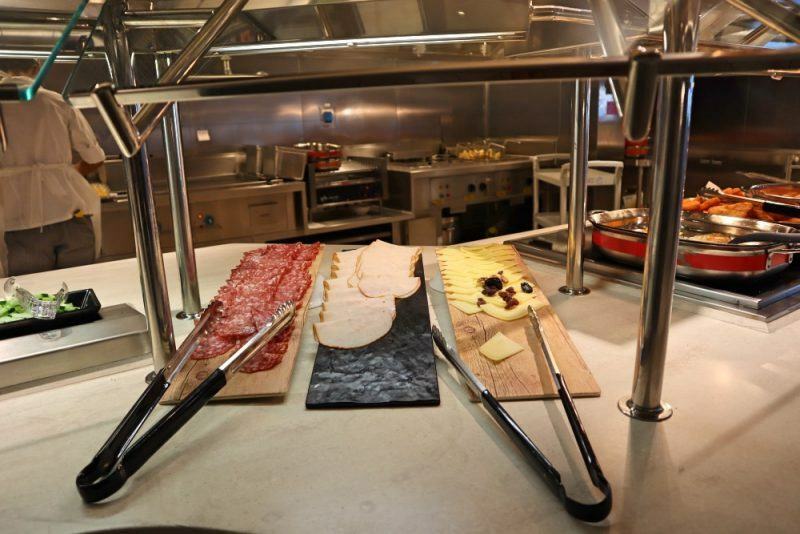 The pizza bar – absolutely delicious! 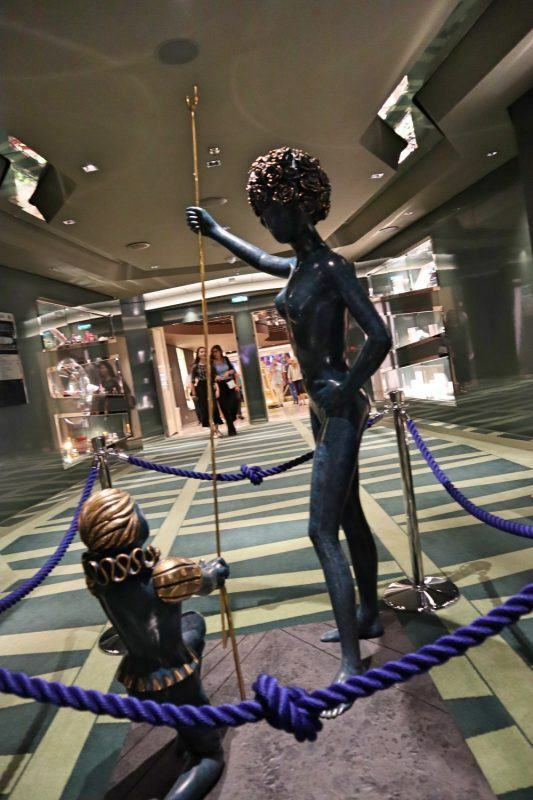 One very expensive statue for sale – stand back kids! 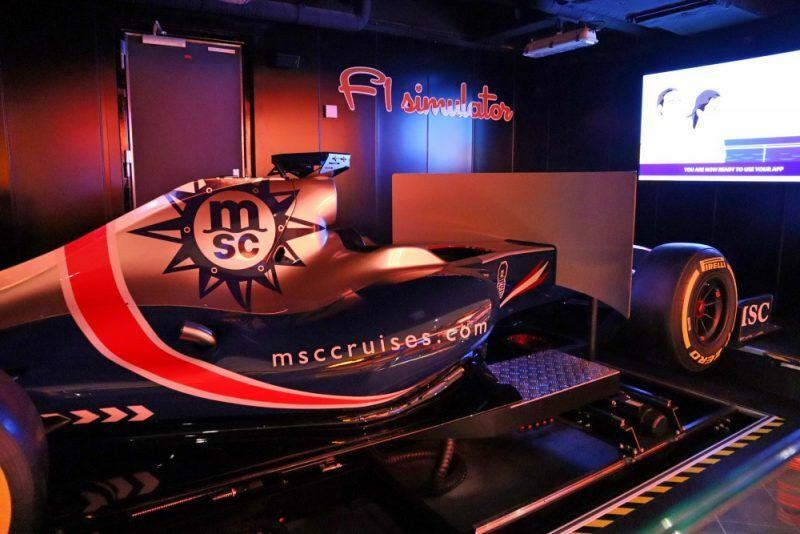 -An amusement arcade with an F1 simulator, 5D theatre, and bowling alley and LEGO playroom for younger kids. Teens have their own hangout area too. 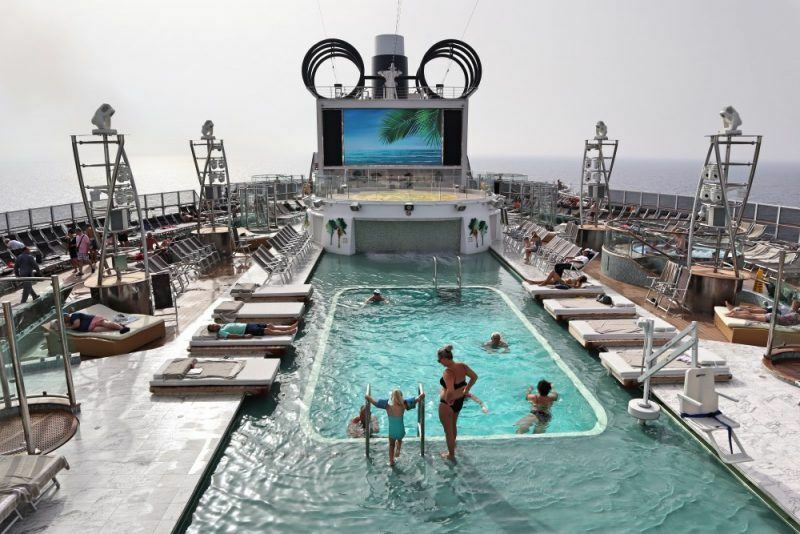 Want to know what to bring on your cruise? 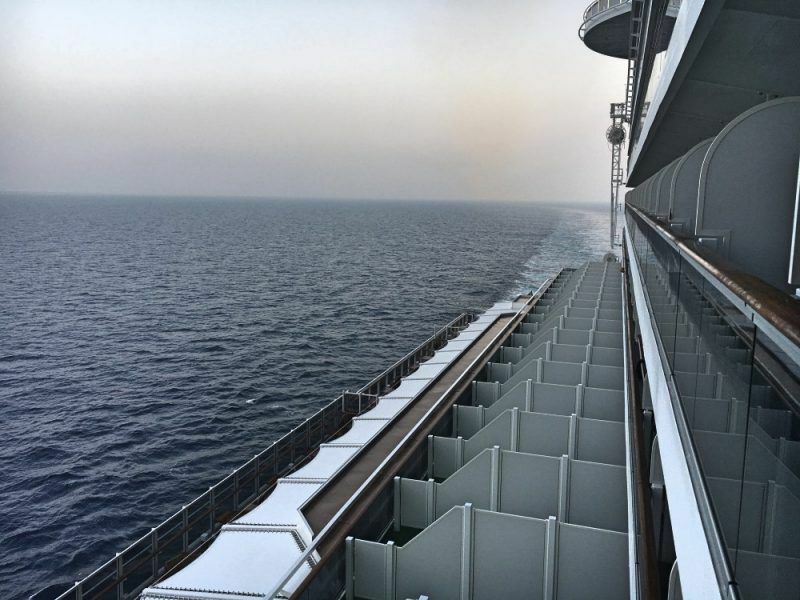 Click here to view The Ultimate MSC Seaview Packing List – How To Pack For Your Cruise and get a free downloadable packing list! 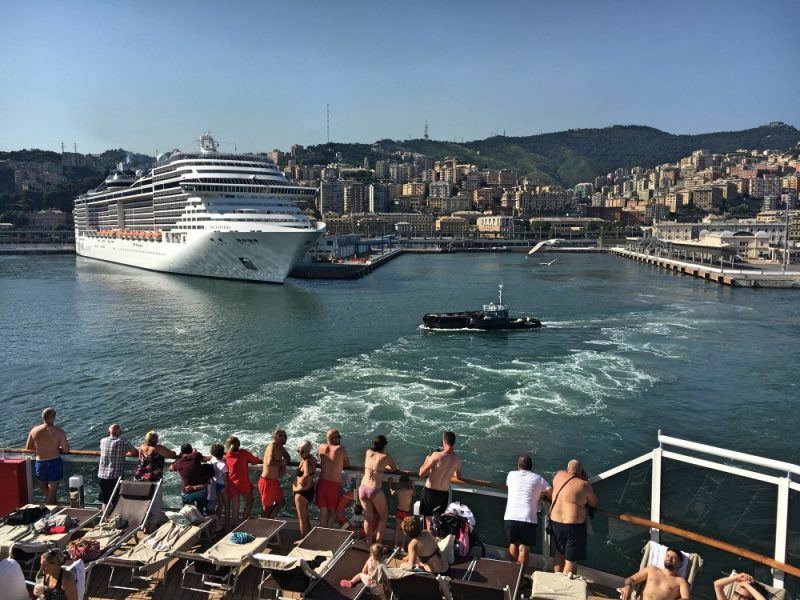 It took us around an hour from arrival at Genoa port to get onto the ship for our MSC Mediterranean cruise, and it was a mostly well-oiled machine given the logistics of getting several thousand people onto a ship at once must be huge! Upon embarking at the trip you’re given a cruise card which is basically your golden ticket to get around the ship. 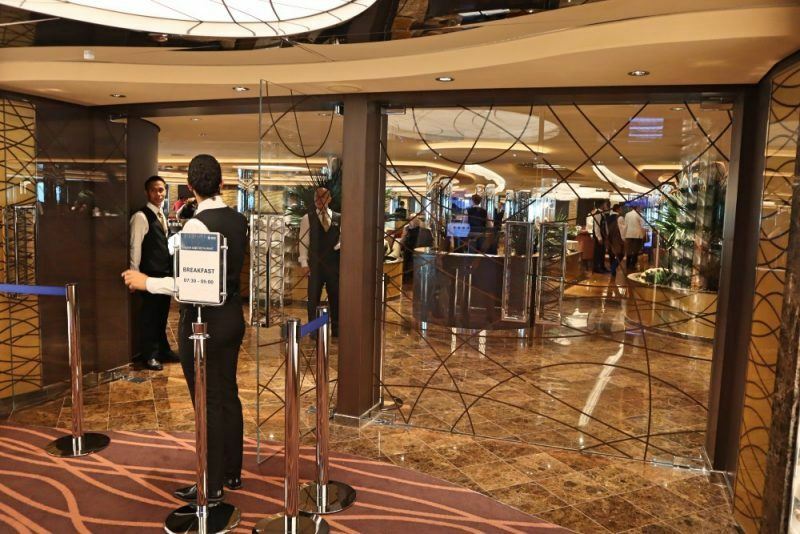 It operates as your room key, charge card and security access on and off the ship. Within the first 24 hours of the cruise you’re asked to visit one of the card activation points on the ship to load 200 euros onto a credit card as a deposit for any on-board spending. 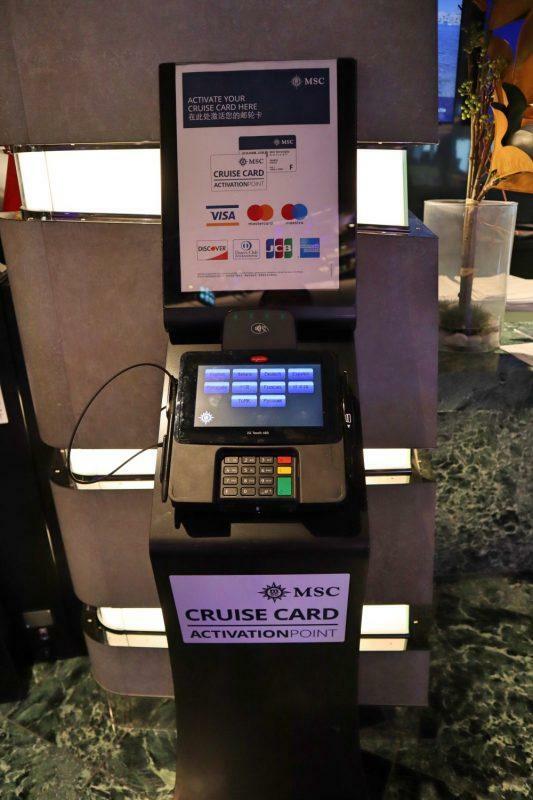 One of the cruise card activation points all around the ship. If you don’t want to carry a card around with you, you can pay 5 euros for an ‘MSC For Me’ watch-type strap that you wear, however you still need to take your cruise card when getting on and off the ship. 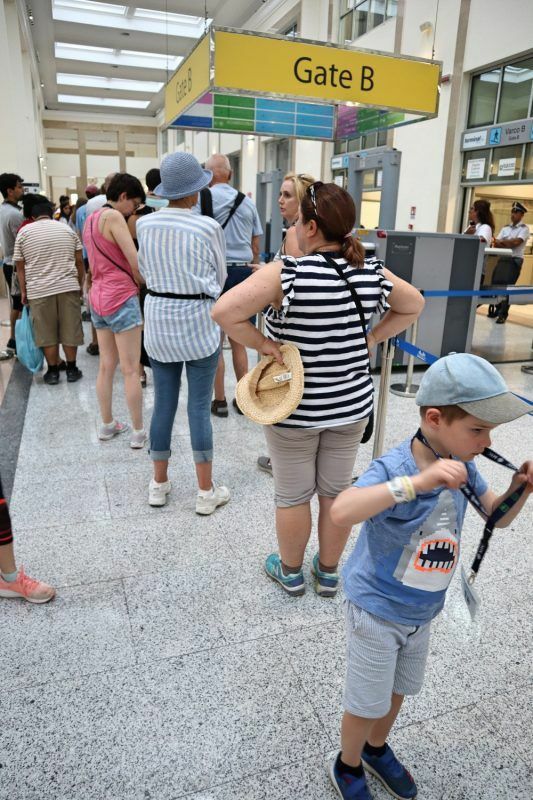 Children are also immediately given an ID bracelet with a barcode that they must wear at all times, so if they get lost parents can be located. It also is colour-coded as to which kids club they can attend. 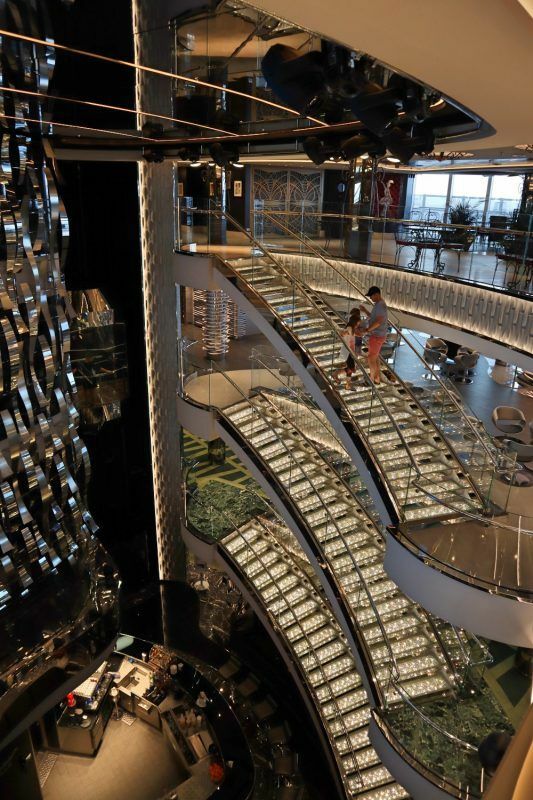 Because the newest ship in the MSC fleet is so huge, it can take a while to get your bearings, particularly when coming out of the elevator. A couple of times we did take a wrong turn and get lost! 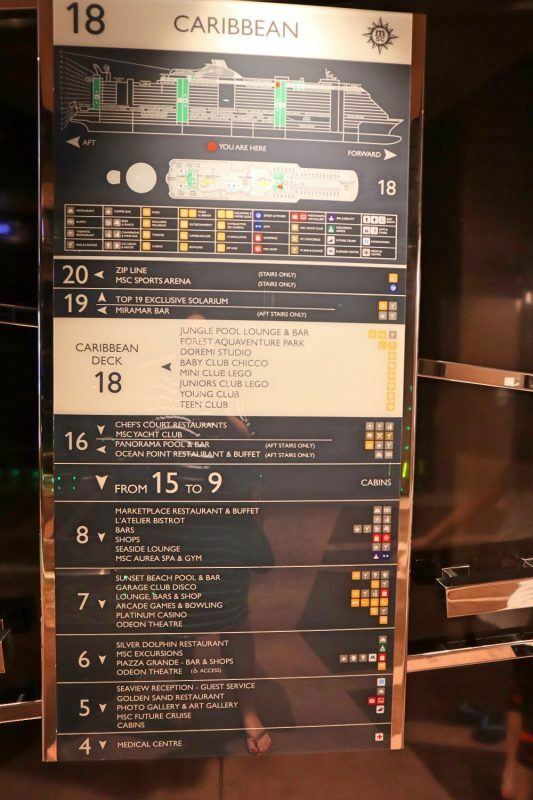 However there are lots of interactive maps located all over the ship to help you find what you’re looking for. …But the interactive maps located everywhere help to find your way. We booked a four-berth Fantastica class cabin on the 11th floor – mainly because this was all that was remaining once we had decided to book a cruise! However this turned out to be a great choice. The cabin was much more spacious than we thought it would have been, with sleeping arrangements of a good sized queen bed with bedside tables and a set of bunks for the kids. 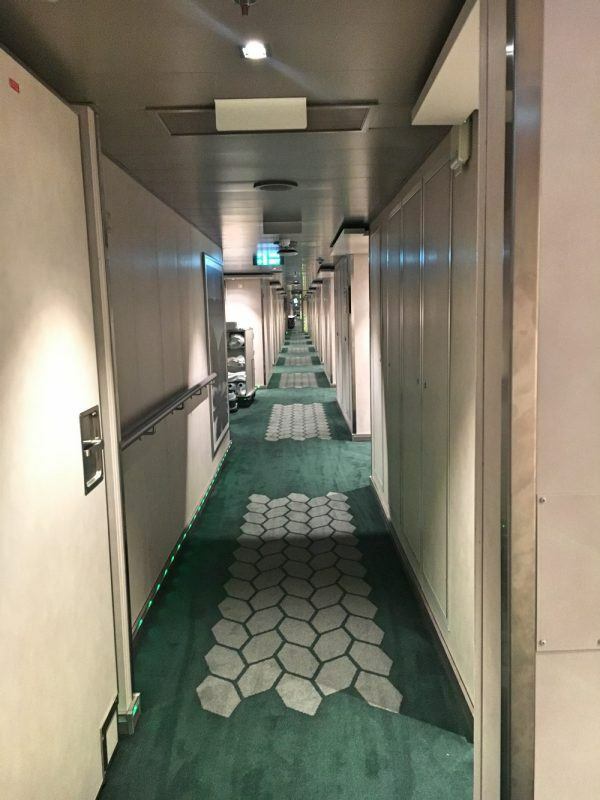 Amenities included a TV, desk with multiple power sockets for electronics, a phone to contact different departments of the ship, a small fridge complete with mini-bar, good sized closet to put clothes with drawers and hangers, a safe, and decent floor to ceiling mirror. 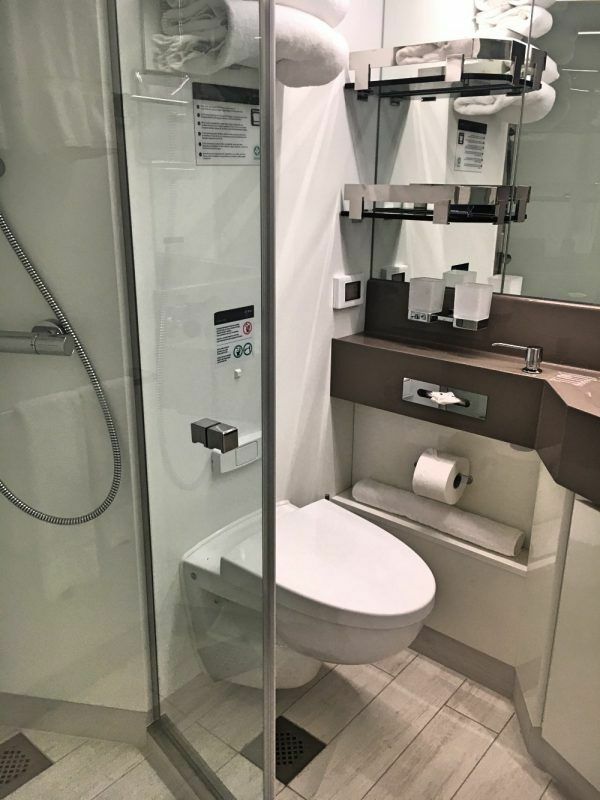 The bathroom was also more spacious than expected, with toilet, reasonably sized shower, basin and good space to put personal toiletries. There was a good triangle spaced area beside the queen bed to put suitcases which kept them out of the way of the main living area. 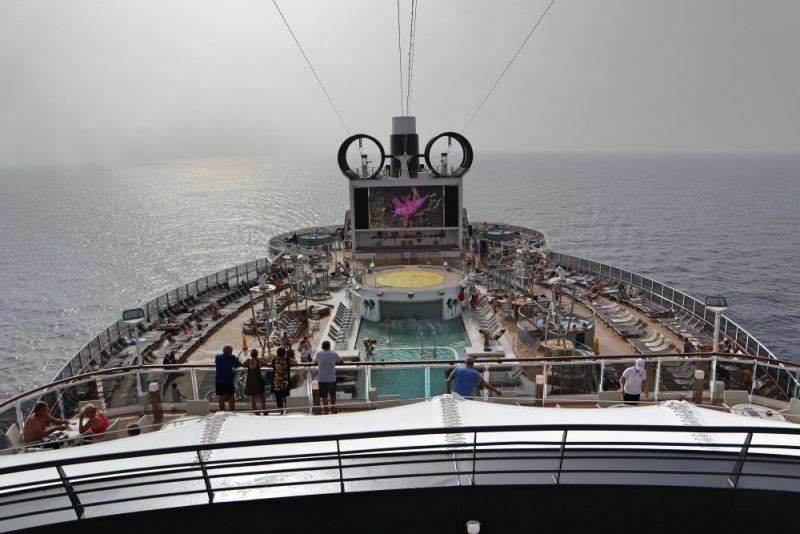 The best thing of all about the room however was the balcony – which has spoilt us for life for cruising, I’d really hate to compromise on this in future as it was just wonderful. The views of the sea were perfect, and with two chairs and a table it was lovely to sit outside after the kids had gone to sleep and enjoy a glass of wine while cruising along. In the mornings we would wake up and lie in bed watching the arrival into a new port, which was an absolute highlight for us. 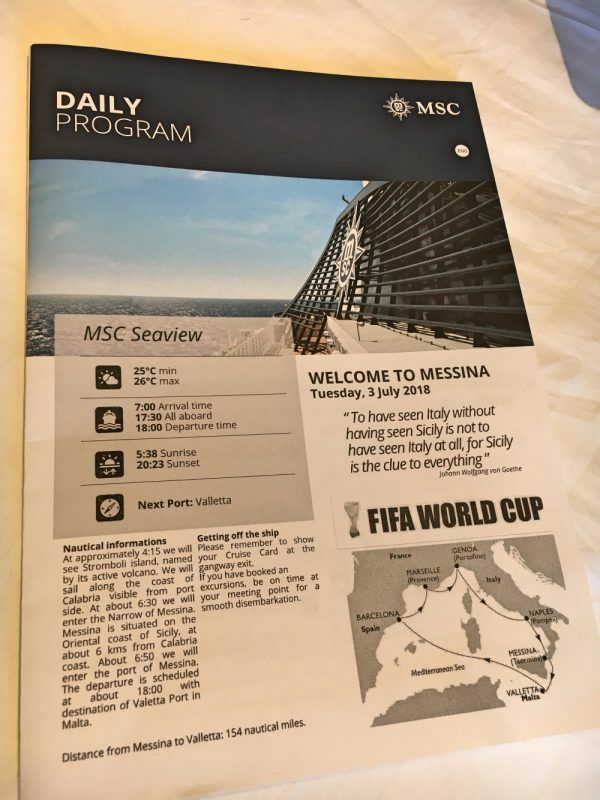 MSC Seaview rooms are promptly made up daily and the standard of housekeeping was high. As the ship is brand new, all the facilities in the room were in great condition. 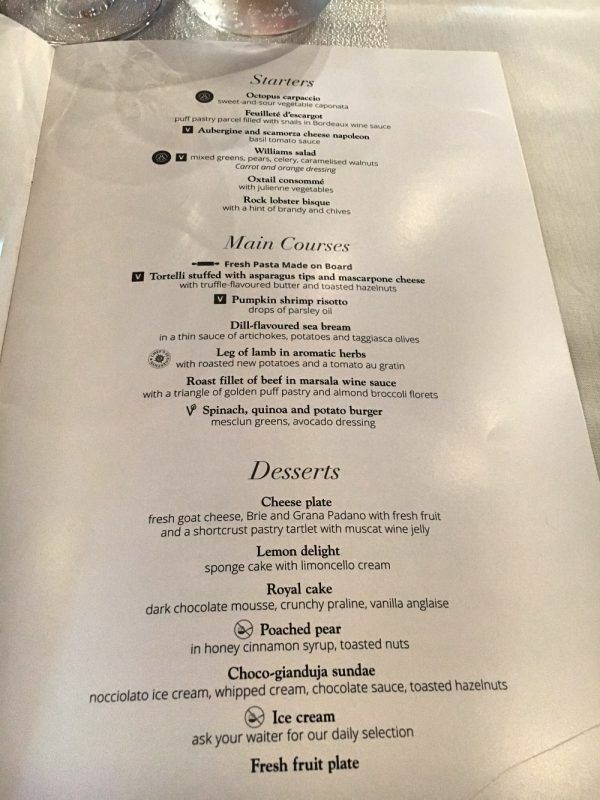 Two pillows are provided – a hard and soft one and a pillow menu is available also if none of these suit. The TV has multiple channels available in English, Italian, French, German, Mandarin, along with a selection of movies available to purchase for 7 euros, and lots of information about the ship and destinations we were visiting. A daily programme is delivered to your room every evening. Each night a Daily Program is delivered to your room which has details of the port you are next visiting, landmarks to look out for along the way, brief facts about the destination, entertainment highlights for the day, important information, and opening hours for all of the restaurants, bars and lounges. This information is also available via an MSC Seaview app which you can download. 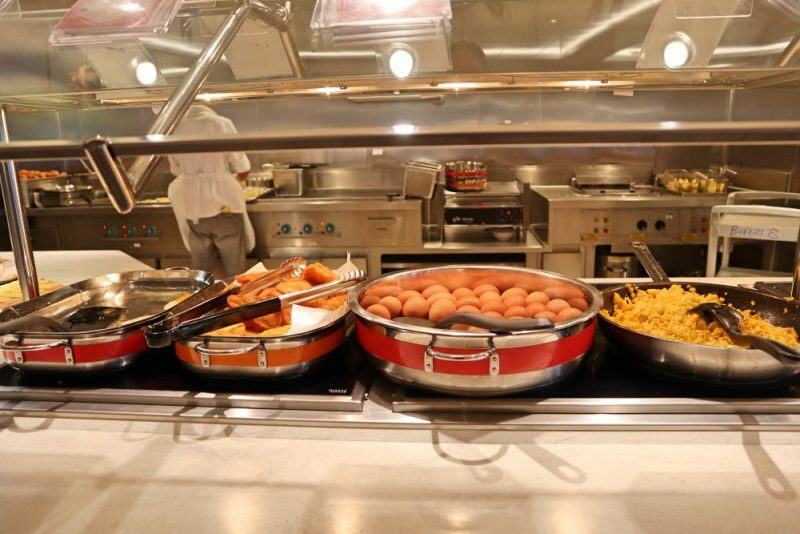 One thing is for sure on the MSC Seaview you will not go hungry! Food is pretty much constantly available at a number of different outlets and it’s all generally high quality. 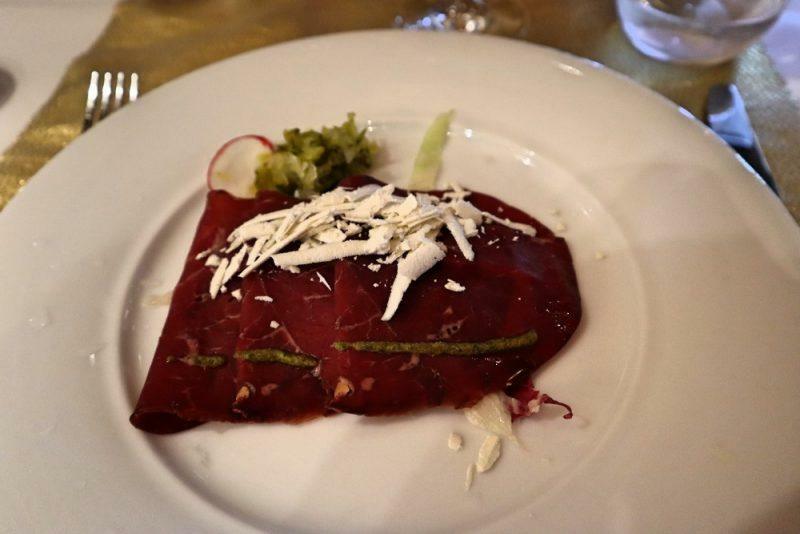 The food served was a wide variety of dishes available, but generally with an over-riding Italian theme. The logistics of feeding over 5,000 people every day to that high standard are quite incredible – as an example the ship goes through four tonnes of basil a week! 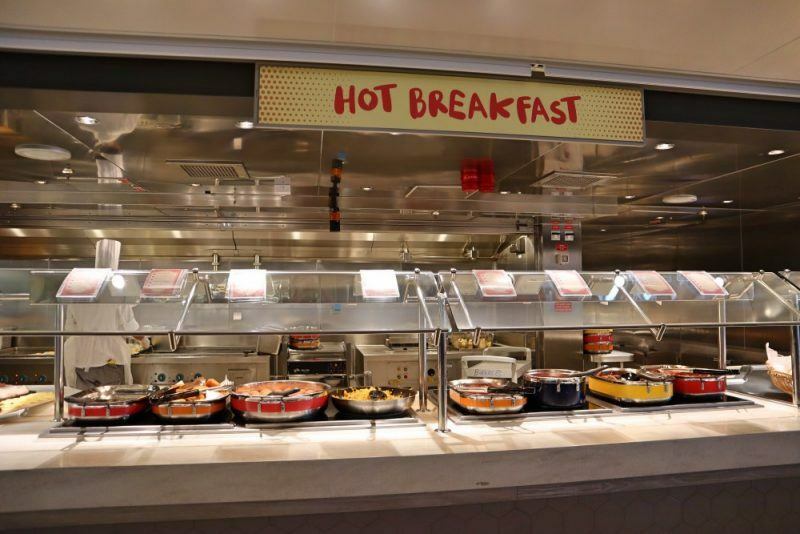 There are two main complementary buffet restaurants on board the MSC Seaview – the Marketplace Buffet and Ocean Point Restaurant and Buffet. Breakfasts consisted of continental style cereals, yoghurt, beautiful fresh fruit, a wide selection of pastries, cakes (in true Italian breakfast style fashion) and breads, cold cuts and cheeses, with the hot breakfast section offering eggs done all ways, sausages, tomato, pancakes, waffles, potatoes, hash browns. I would say it had the greatest selection of food of any hotel I’ve ever stayed at and it was very tasty. Lunch was a variety of salads, rotisserie/grill selection with chicken, beef, fish, vegetables, sandwiches with beautiful fresh bread, cheeses, a whole dessert bar and more amazing fresh fruit. 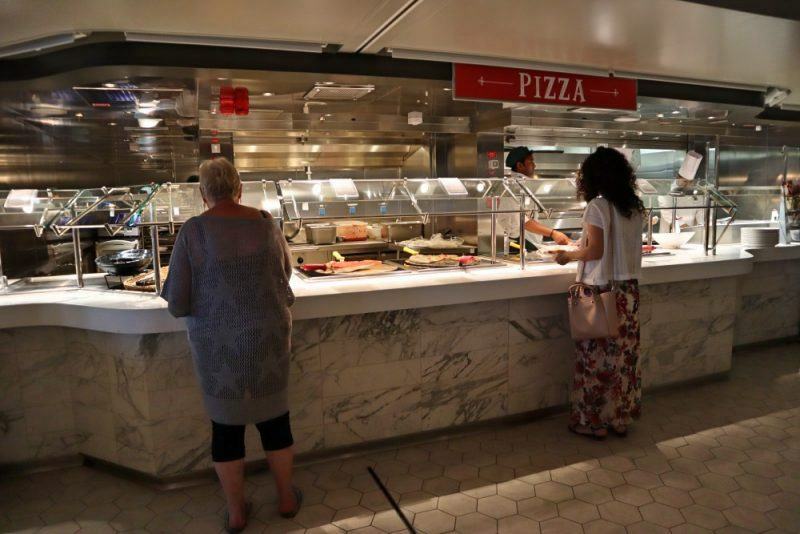 Being an Italian ship there was always a few pasta dishes available and more pizza than I’ve ever seen in my life and it was delicious! 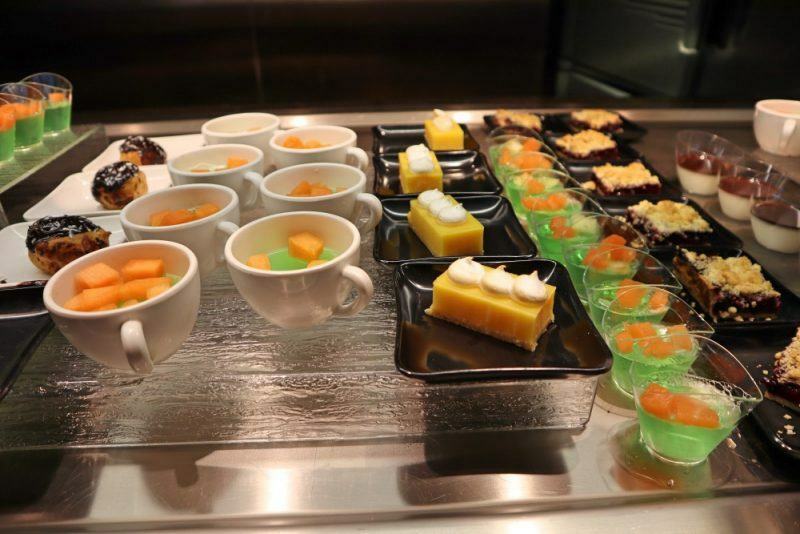 The buffet style dinner as an alternative to the main ship restaurants was more of the same, but always of a wide variety with lots of dishes to choose from. The biggest issue is that your stomach won’t be big enough to try all the amazing food on offer. 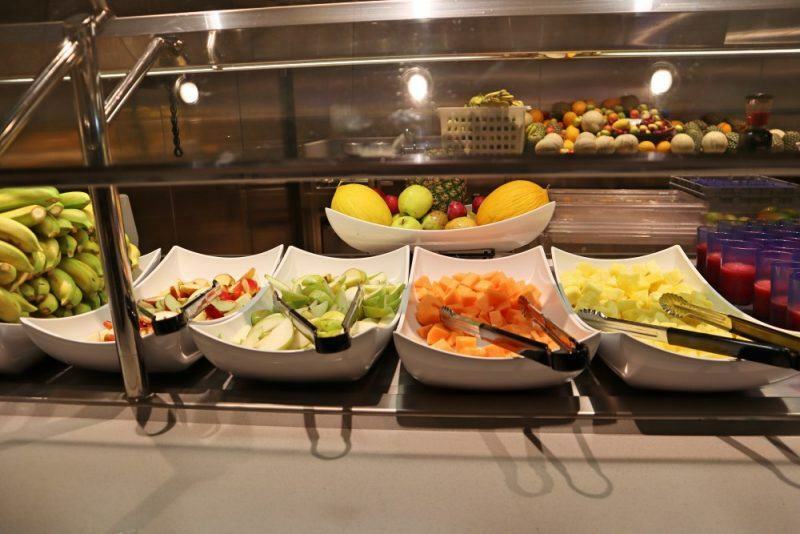 Our kids actually preferred dining at the buffet restaurants during dinner due to the large selection on offer. They found the hamburger/pasta and hotdog offering of the main a la carte restaurants a bit bland! 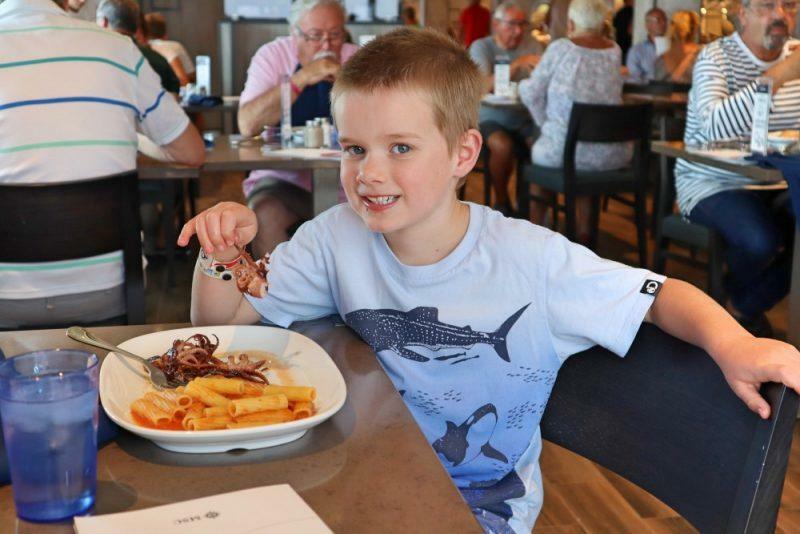 Enjoying baby octopus at the buffet! Our eight year old loved piling up her plate with salad and fruit – I would venture to say she ate more healthily than at home! 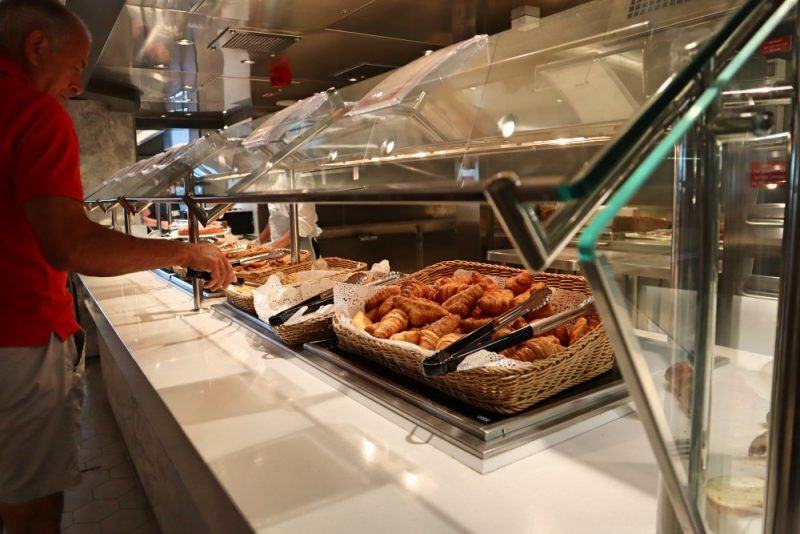 Hygiene standards are very high – all of the staff wear gloves and are particular about how they are handling food. There are hand washing stations at the entrance to all restaurants. 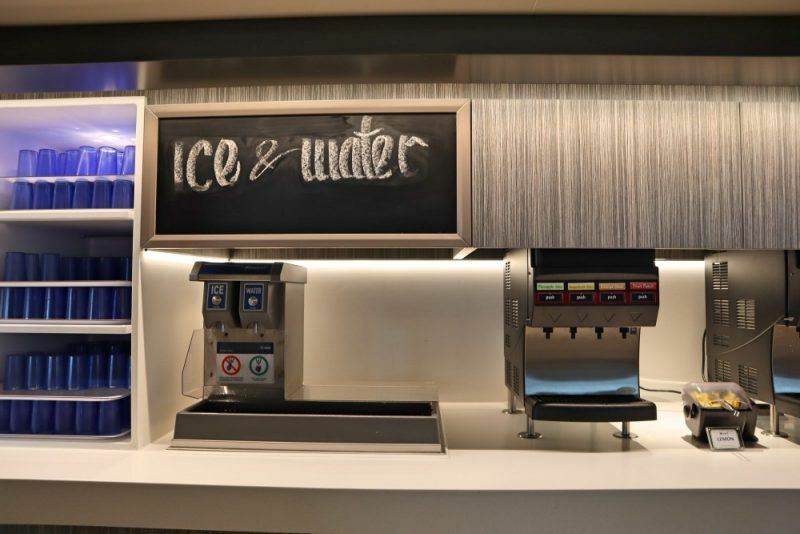 At the buffet, there is always water and ice available along with tea and coffee. At breakfast time juice dispensers are also available. You pay extra for all additional beverages. The two main complementary dining restaurants are the Golden Sand restaurant and Silver Dolphin restaurant. You are allocated to one of these on arrival, and given a dining time that you choose at time of booking. We chose early dining given we are travelling with our kids and are all a bit jetlagged, so got allocated the 5.45pm slot at Golden Sand restaurant. 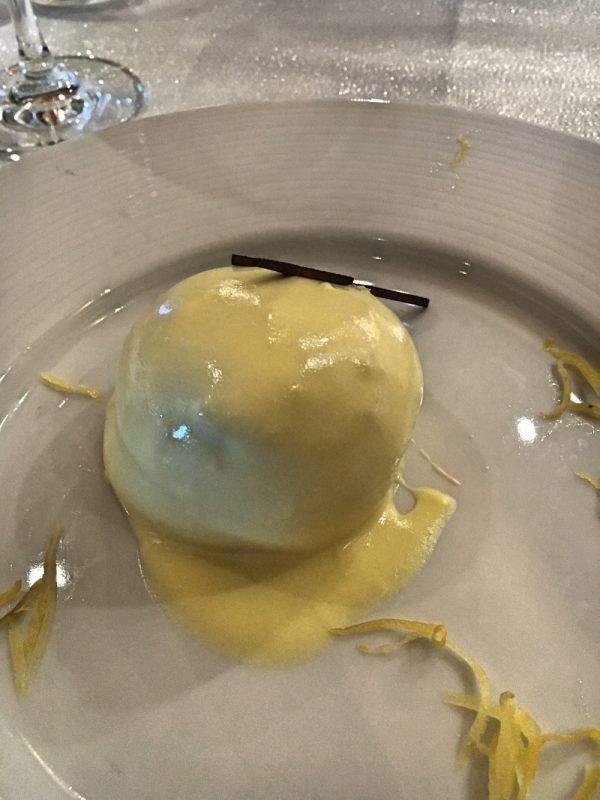 The menu is a la carte, with a choice of entree, main and dessert. 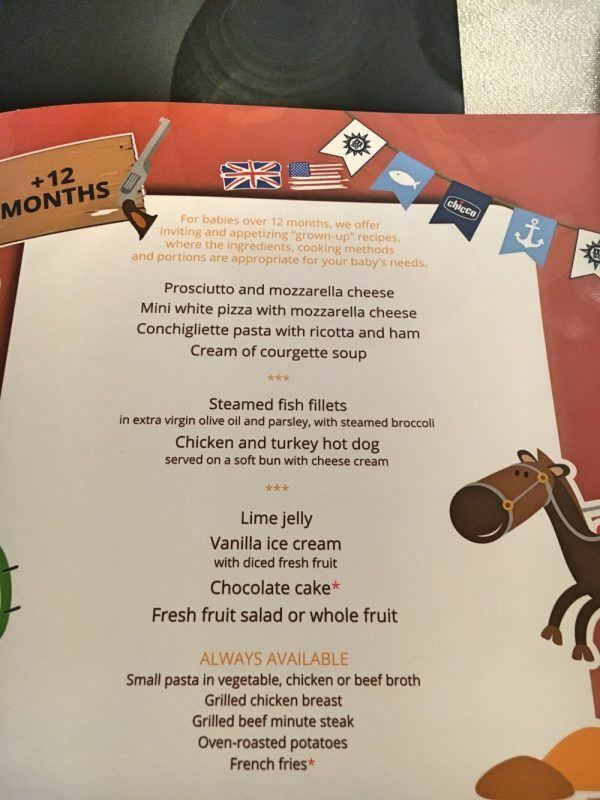 A kids menu is also available – catering for babies as well as younger children. 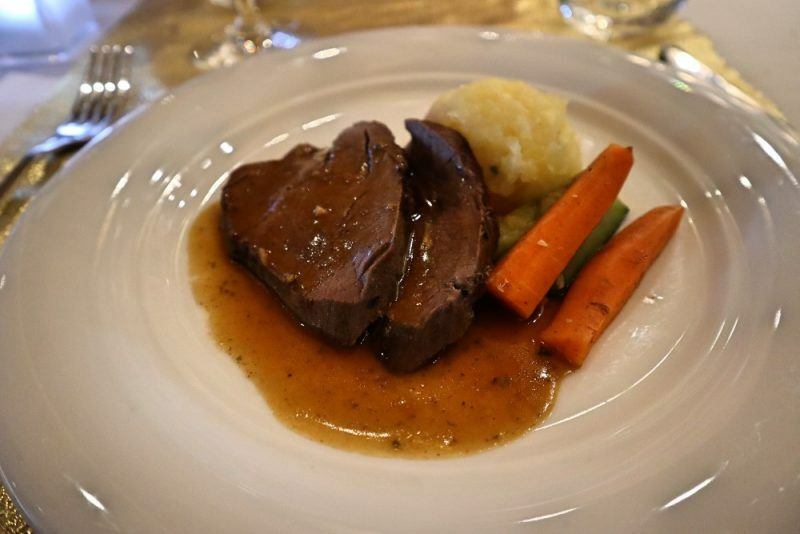 Again the food is of a high standard, and there is generally a choice of 4-5 different entrees, mains and desserts. The restaurant is more formal than the buffet dining ones, but there isn’t strictly a dress code as such. 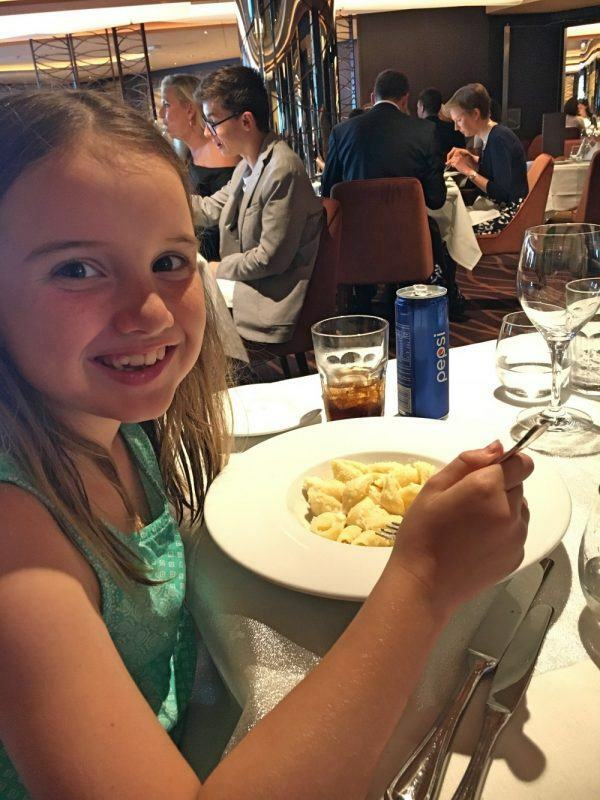 We didn’t try any of these however as we were happy with the complimentary restaurant options and with kids we found them to be better options for us. 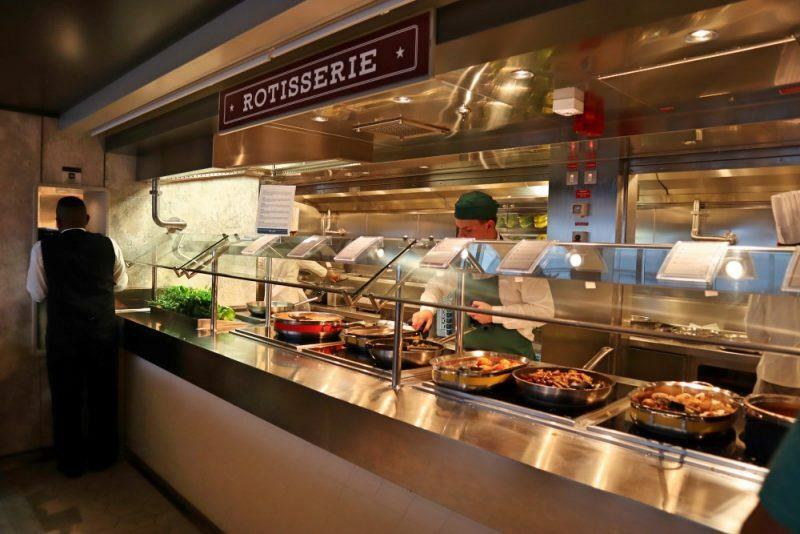 Staff would walk around selling dinner packages or you can book directly with the restaurants. 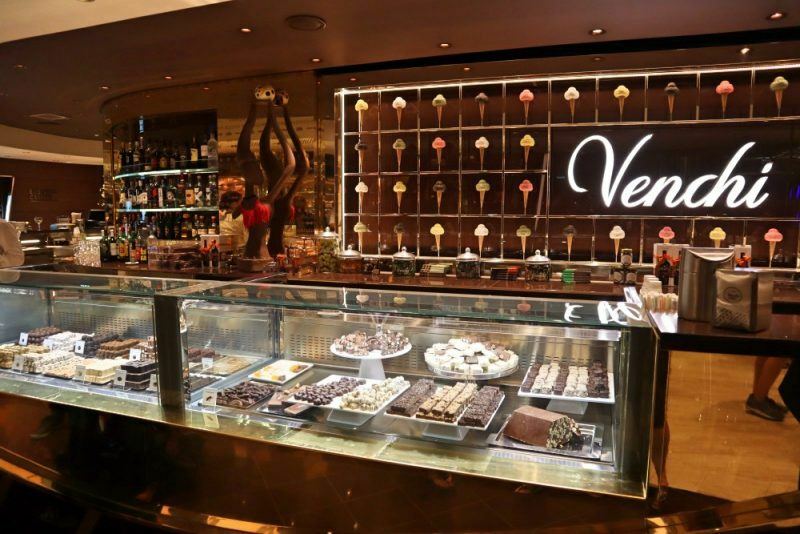 Venchi – look at those handmade chocolates! 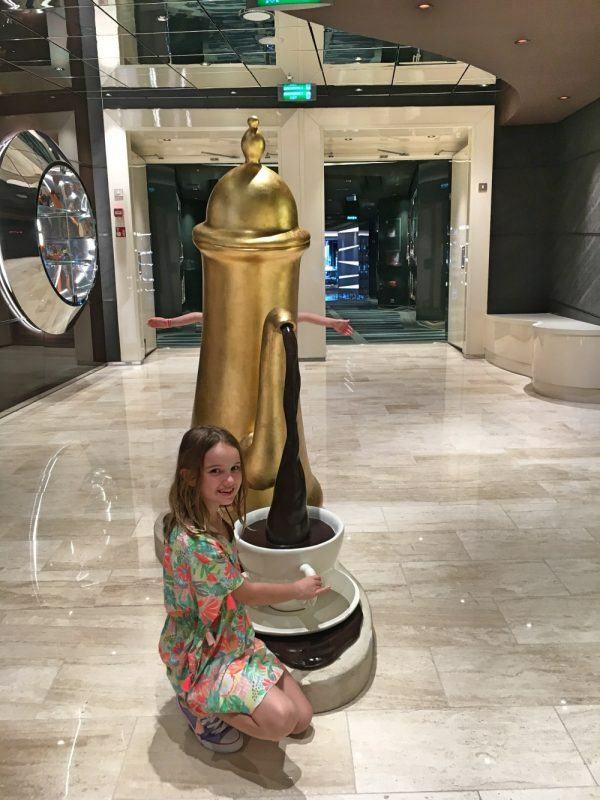 The Venchi chocolate and ice-cream bar had drool-worthy offerings – the ship has a partnership with the 140-year-old Italian confectionary legends, and the gelato is made fresh on board. The Sports Bar – showing different sporting fixtures from around the world on huge screens or in intimate booth style settings with comfy beanbags. The bar is decorated with sporting memorabilia. 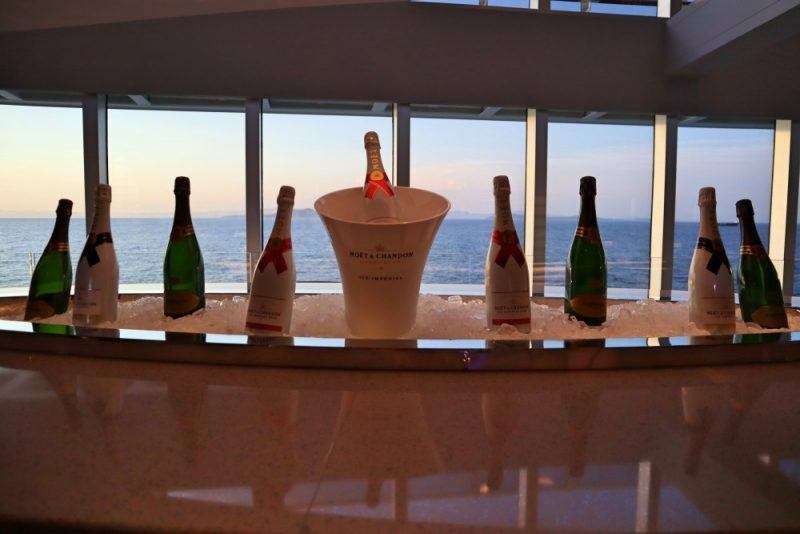 Comfortable sofas and stunning views from the Champagne Bar. 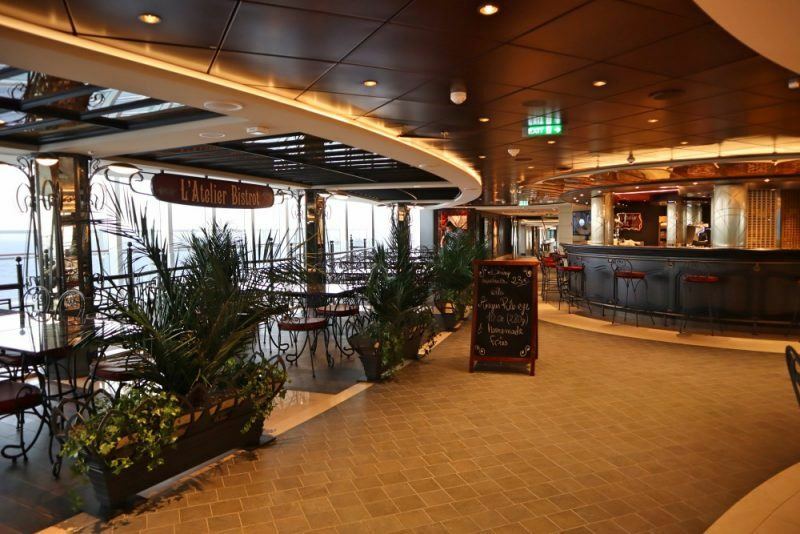 The Champagne Bar – probably the best indoor bar on the ship in terms of ocean views. Lots of different varieties of champagne available to drink on chrome bar stools or comfy leather lounges. The car at the Garage Bar! 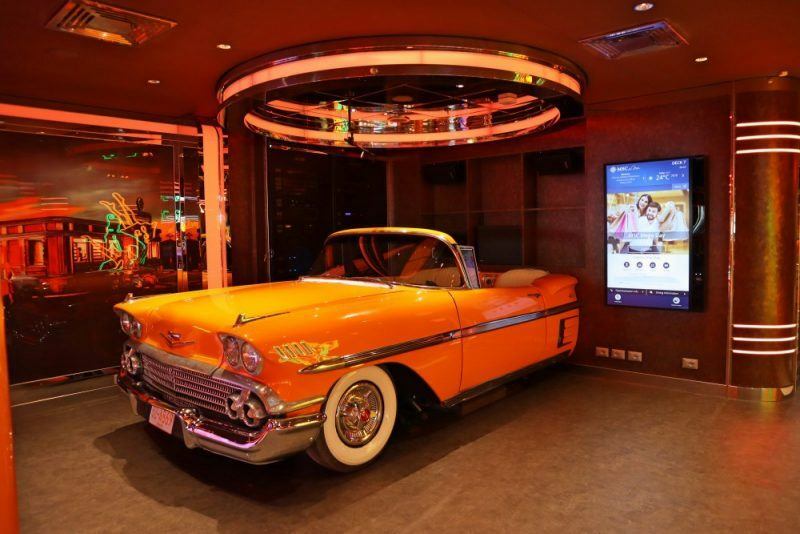 Garage Bar – a 50’s Americana style themed bar complete with disco floor, half a Chevvy car and Lambretta scooter. Looking down on The Main Reception Bar where you can enjoy a drink and watch the nightly performances. 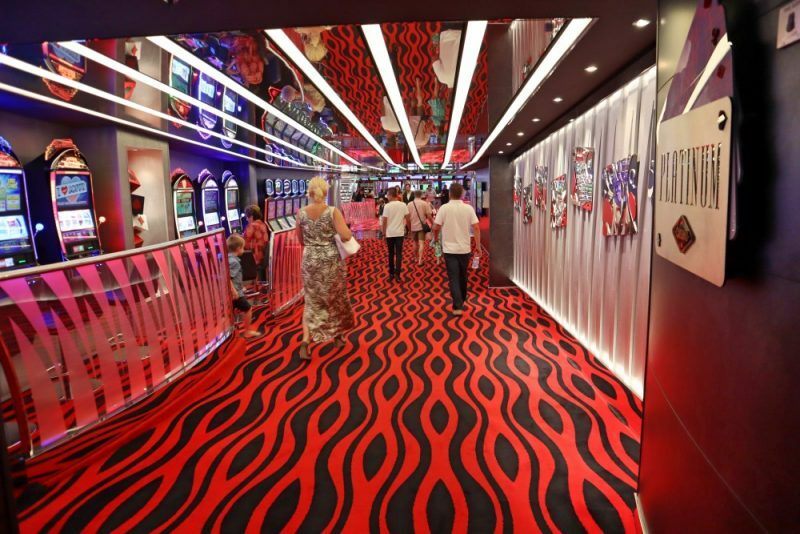 Casino Bar – In the middle of the casino, also one of the bars you can smoke at. Jungle Pool Bar – Near the Treehouse adventure zone and waterslides, it also has gelato for sale. 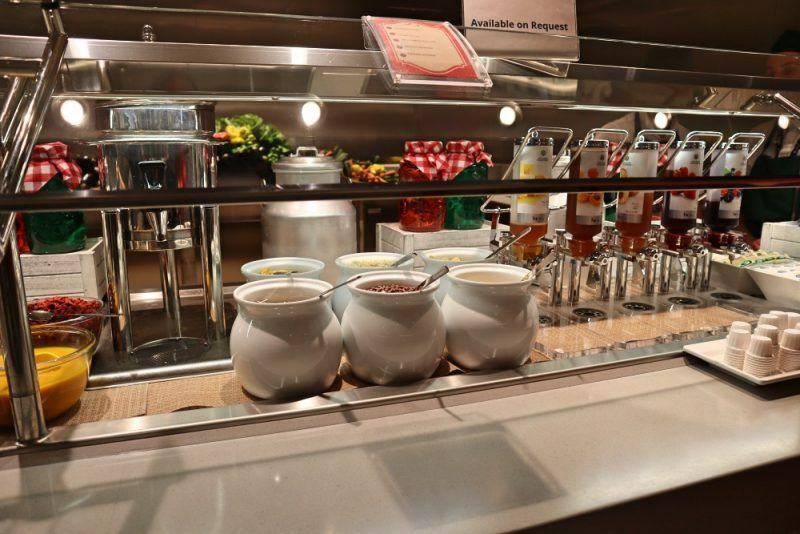 The two buffet restaurants also have bars in them to order drinks from. 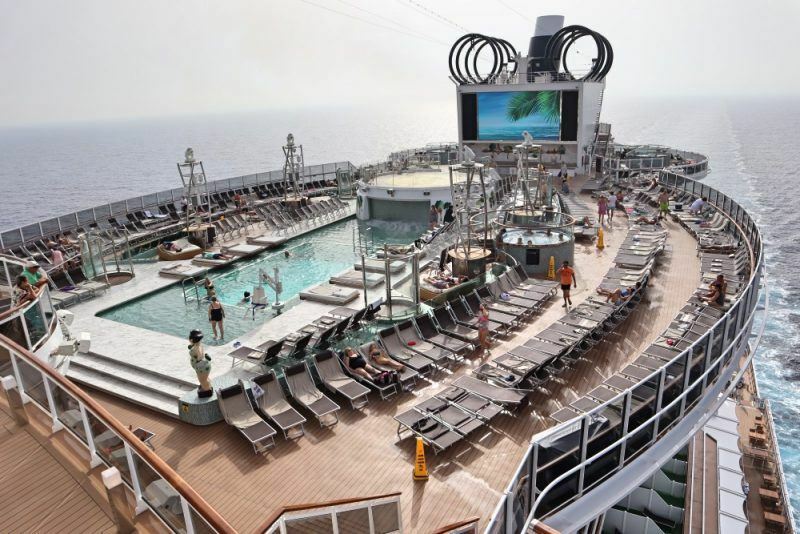 MSC cruise packages are available to purchase for extras such as drinks, the spa and excursions. We pre-booked our drinks packages from home and purchased a water and wine package which provided 7 bottles of water and 4 bottles of wine, and a soft drink package for the kids. In hindsight we probably didn’t need to do this as you can purchase on board, so there’s not really any advantage in pre-purchasing as the prices are the same. There were a few times when it was super hot and we would have preferred a beer to a wine! Alcohol prices on the ship were reasonable and in-line with what you would pay in a bar or restaurant, definitely no additional price gouging going on which was nice to see. 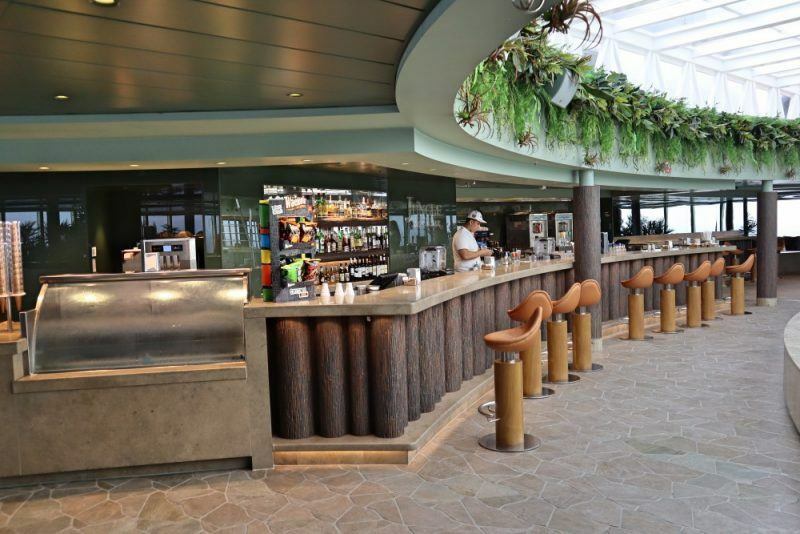 There are a huge range of cocktails also available at the various bars around the ship. 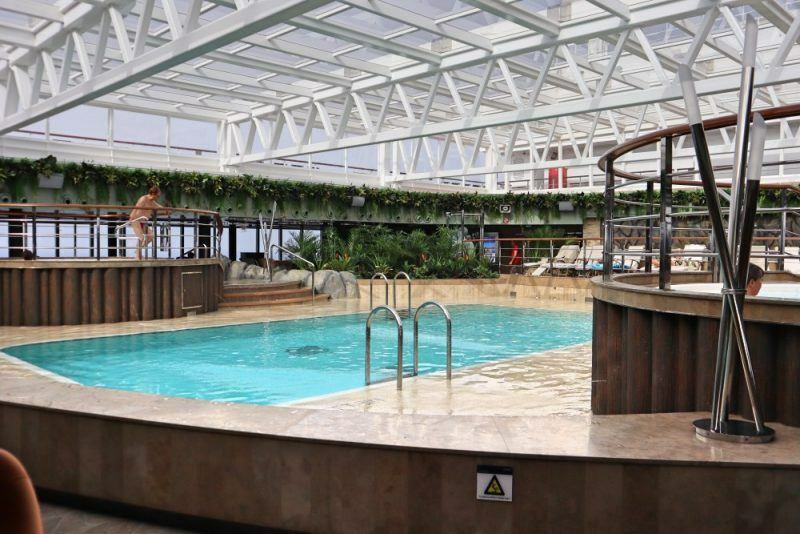 There are three swimming pool areas – the main pool on deck 19 which has the majority of sun loungers and is very popular. There are also some whirlpool jacuzzis but these were always very crowded so we didn’t use them! Just below this is the Jungle Pool area next to the Treehouse adventure area and waterslides. This was our favourite pool although it was smaller as it tended to be less crowded and the kids could swim then jump on the adjacent waterslides as they wanted. It has a roof over it but this was opened up most days. There is also a jacuzzi in this area also. 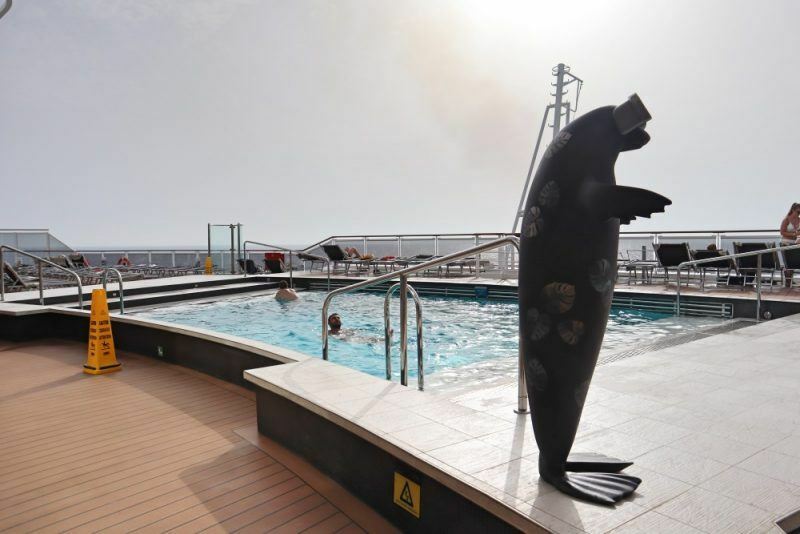 The Aft Deck pool complete with happy seal! 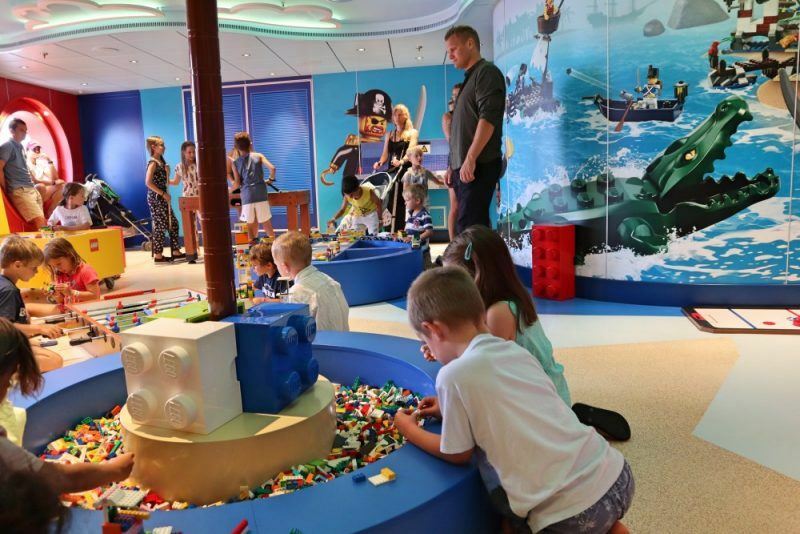 There’s lots to do on board for kids on this MSC new cruise ship. It’s so big that exploring it will take up a big chunk of time! Having a boogie at the disco! Our favourite was the incredible Adventure Treehouse area which is a huge splash pad area that’s easily as good as any we’ve paid to play in before. 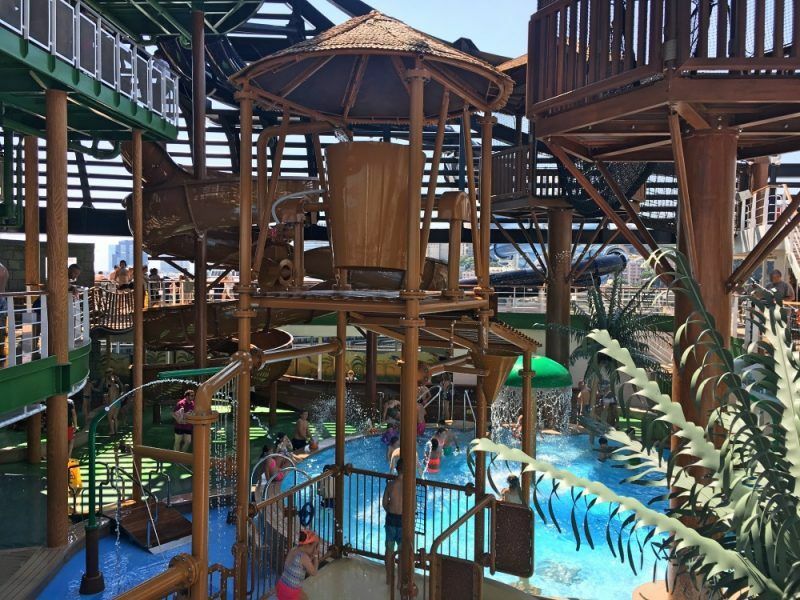 There are three different waterslides (note there is a minimum height which our 6 and 8-year-olds easily met, and you need to sign a waiver before letting the kids loose on them!) 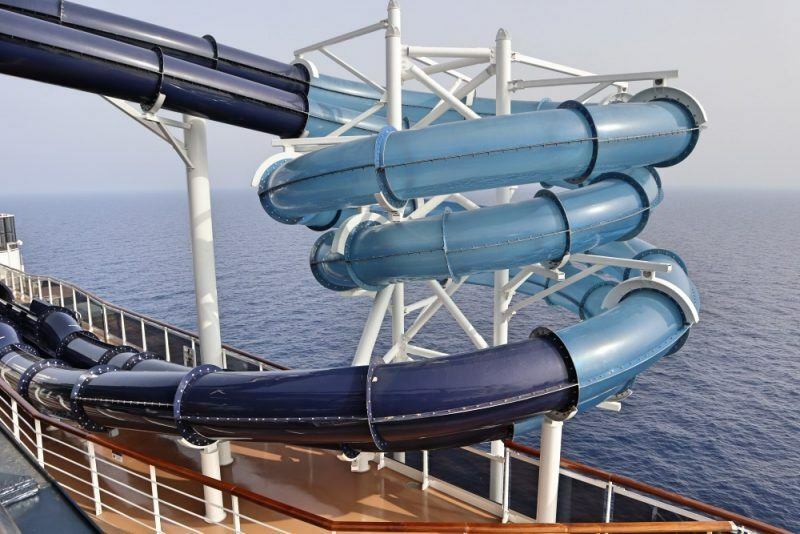 Two of the waterslides hang out the side of the ship which makes for a great adventure as you zoom down. 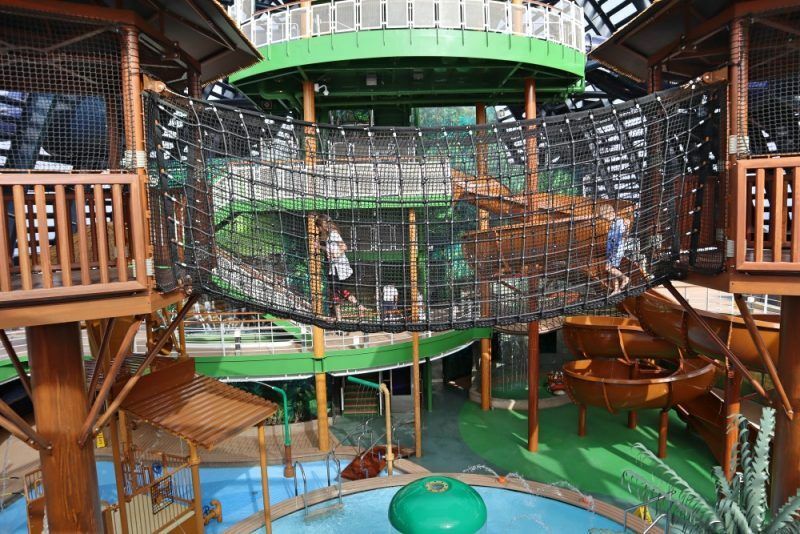 The Adventure Treehouse is also a rope course that runs above the splash pad area but it’s all very safe and our kids felt comfortable using it. 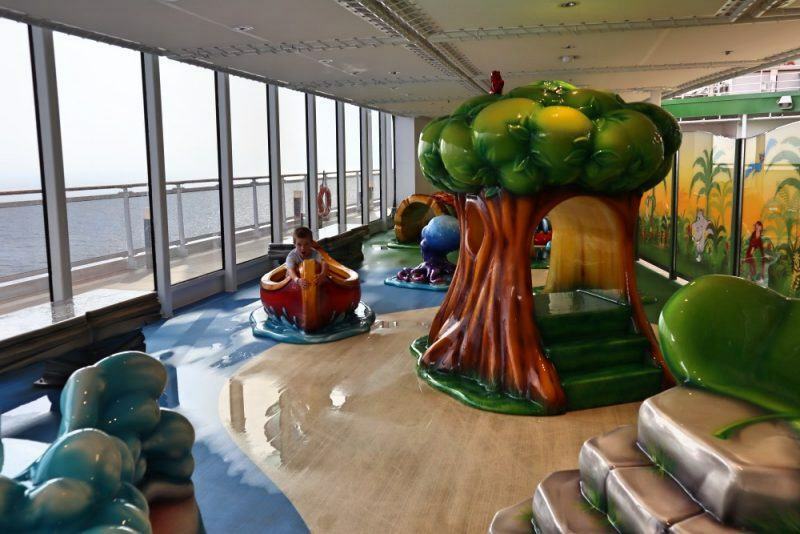 There are three kids clubs on board in the Doremi fun area on Level 18 – one for teens, one for 7-12 year olds, one for 3-6 year olds and a baby kids club as well. Because our kids were split between two age groups they weren’t keen on going into the kids club, and because we’ve all been so busy in the lead up to this trip our focus was on spending time together, so we didn’t actually leave the kids in the club. We did go up to the kids club area one day though to check it out. The area was a bit smaller than I expected it to be and I think would feel a little cramped if you had lots of kids in there. But there was tonnes of Lego, a couple of football tables, and board games to choose from. 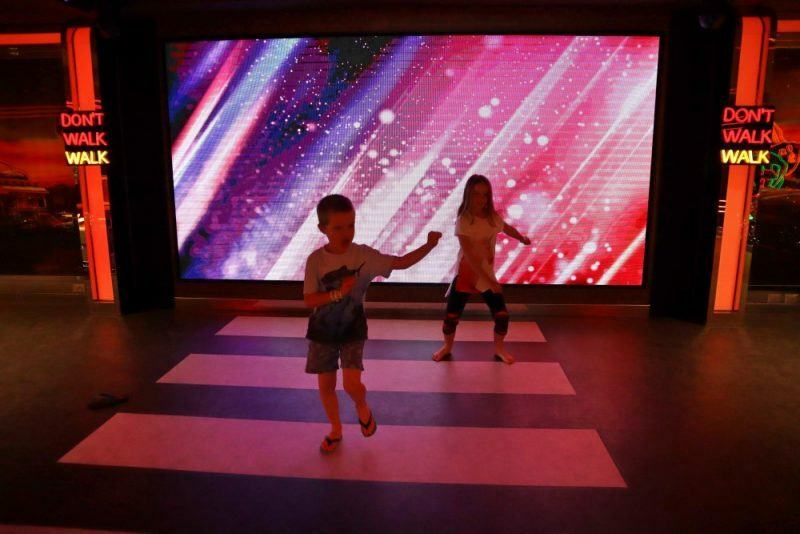 As part of our Fantastica package we were given a mini-chef lesson for the kids, but when we turned up to use it there were literally hundreds of kids crammed into one of the disco floors and it was pretty chaotic, hot and loud so we didn’t hang around. From what we could see each child had a piece of pizza dough, so we presume it was a pizza making lesson?! There’s so much to do on board the MSC Seaview that a week almost isn’t long enough to experience everything on offer. 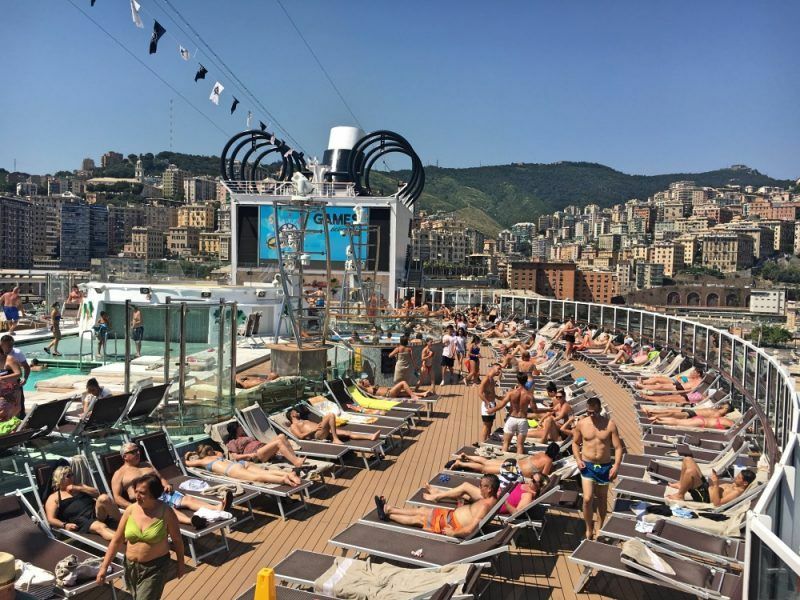 The daily programme and MSC app have all the details of what’s on around the ship – lots of fitness activities which are a combination of free and paid, from the afternoon and evenings there is always a number of DJ’s bands and singers in different areas of the ship. 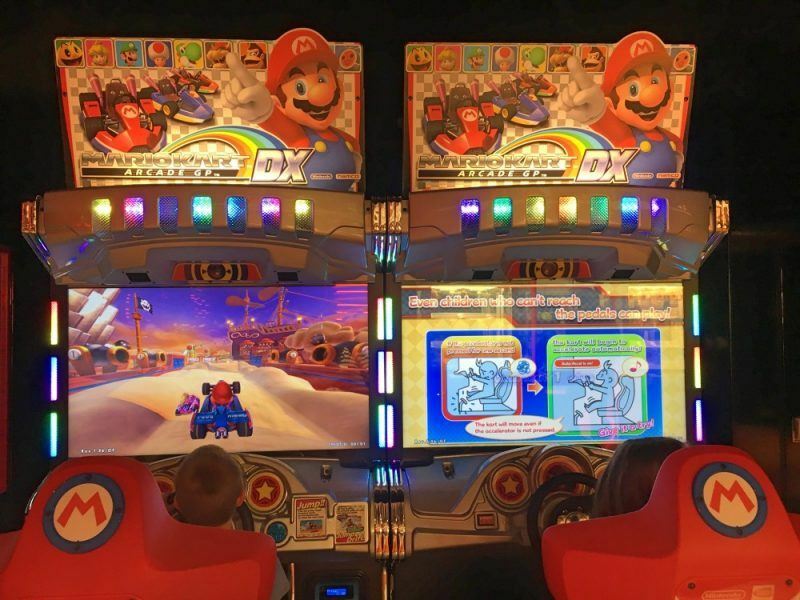 If you like a flutter then the casino has hundreds of slot machines and as mentioned the fun arcade area has lots of activities available. 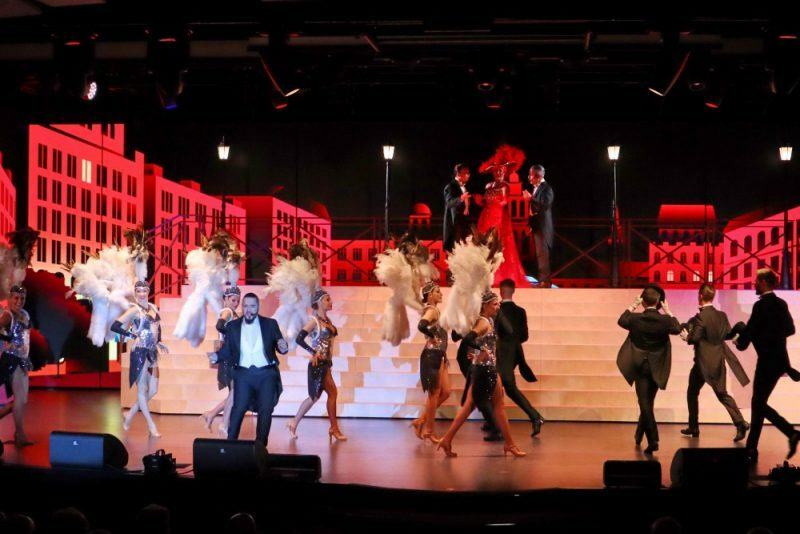 But the highlight for us was the nightly Broadway style show presented at the onboard Odeon Theatre. 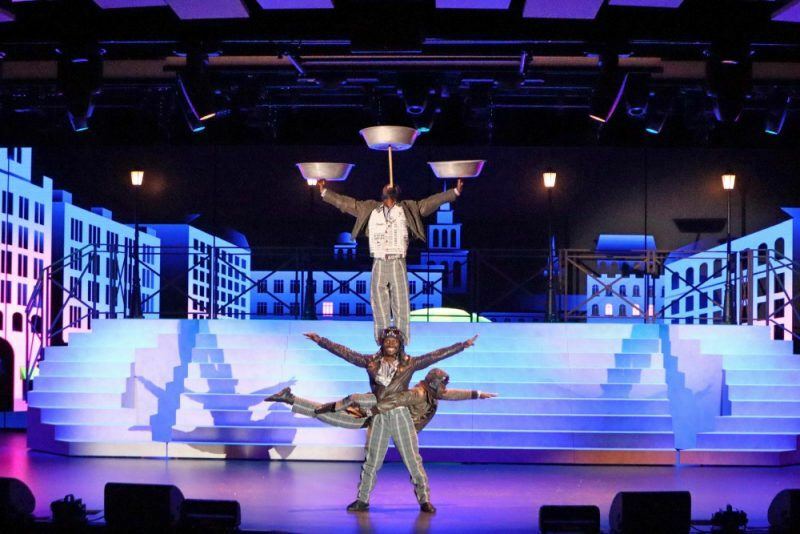 We saw two shows – Bizarre and Fantasia, both around an hour long and featuring singing, dancing, acrobatics, magic and theatre. It was extremely professional and the kids in particular were spellbound the whole time. 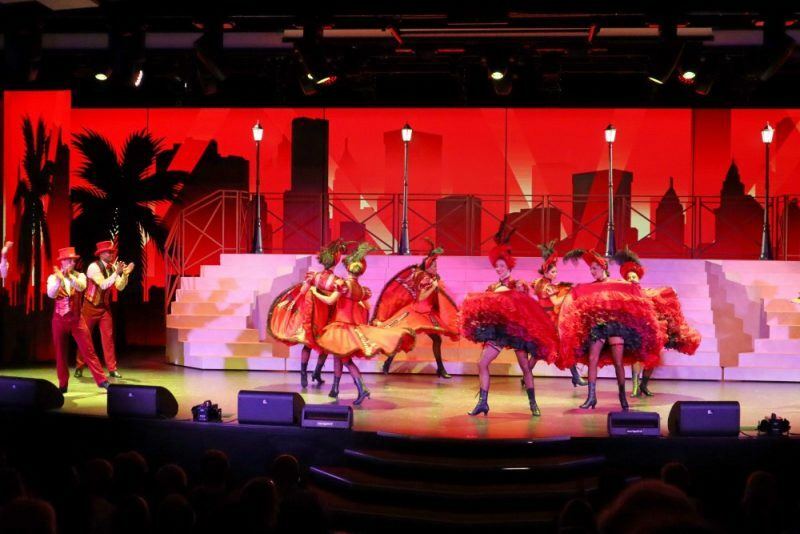 There were four different shows on offer during the week and you could attend each one once during your cruise. Internet is available on-board – but for a price. There are a few different packages you can purchase but it is expensive. However given that it’s satellite internet the whole time (even when you’re in port) it’s understandable. A great excuse for a digital detox! 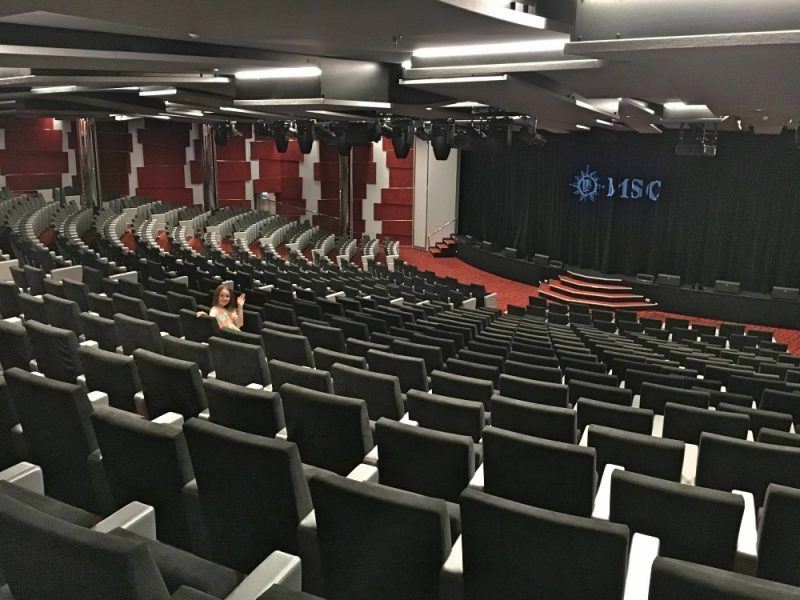 So while the ship is amazing, it’s also good to get off and actually take a look at the places you’re visiting while on an MSC European cruises! 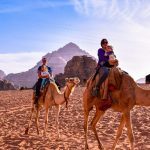 There are a huge variety of excursions you can do that you can either book before you leave home or from the on-board excursion desk. 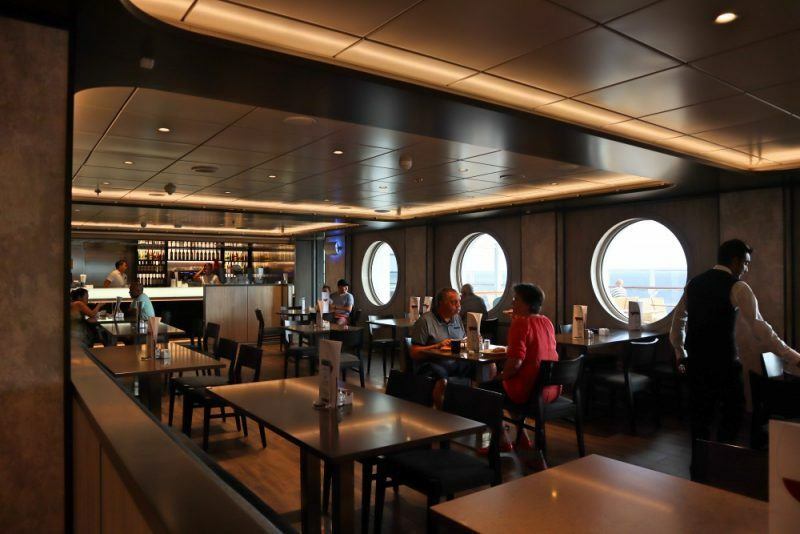 The bonus of booking MSC cruises shore excursions is that it’s so easy – you literally step off the ship onto a bus and don’t have to worry about any of the logistics of getting around. Also there is a guarantee that if the excursion you are booked on is running late, the ship will wait for you to return. 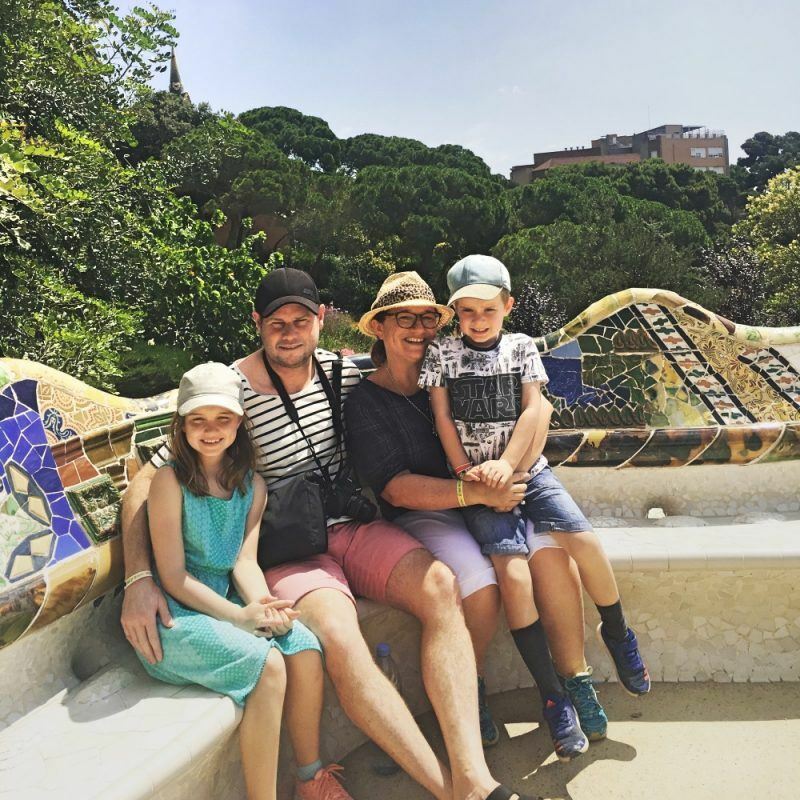 The downside is the cost – they are very expensive and it quickly adds up if there is a family of four or more travelling. 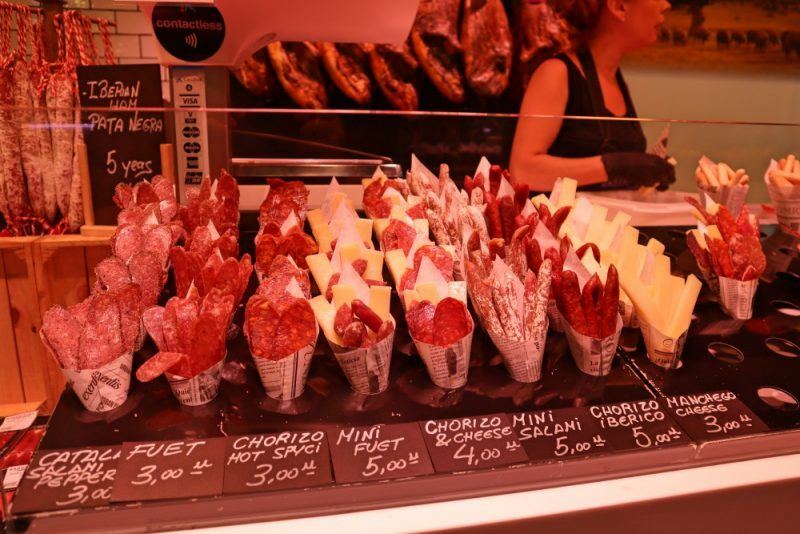 Some of the options looked amazing but were hundreds of US dollars and outside our budget! We’ve learned how to save hundreds on shore excursions – click here to find out how you can too! 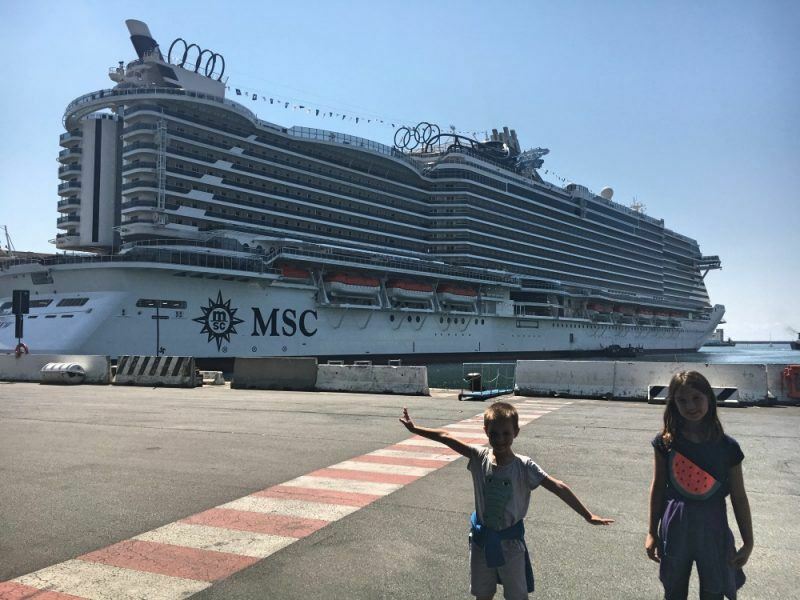 So we were a bit selective and chose two excursions at MSC cruises ports, then chose to do our own thing for the remaining ports. 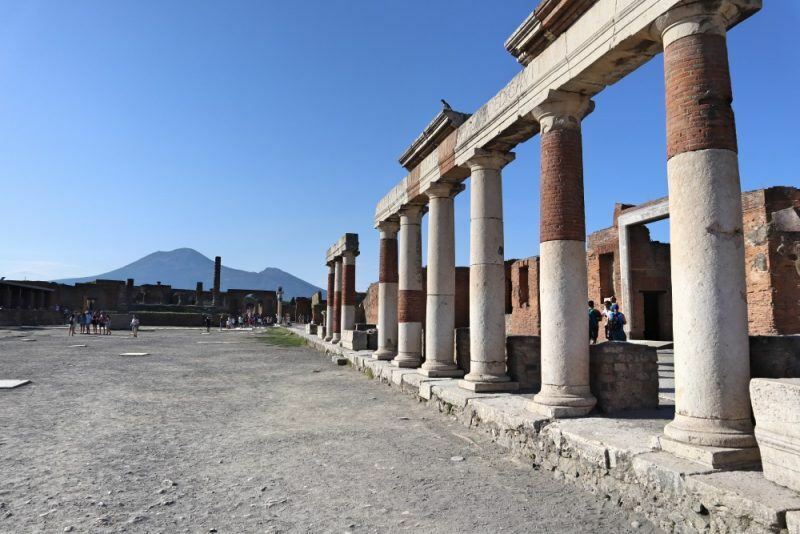 Naples – Pompeii – we took a tour from the port of Naples to Pompeii, the site of the ancient town that was covered in ash from the massive Mt Vesuvius eruption nearly 2,000 years ago. There were a lot of people doing this excursion so it was a bit crowded getting off the boat, but once we found our way to our bus (over 18 coach loads of people doing this tour!) it was fine. Our guide was excellent and extremely informative and we really enjoyed our 1.5 hour tour. 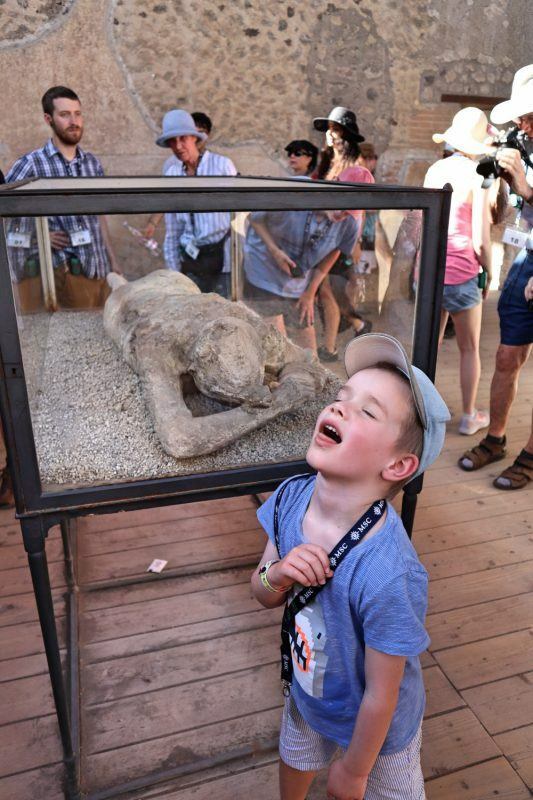 Jack re-enacting the Pompeii eruption! The kids also very much enjoyed it and while the timing was short it was very hot, so that was about their limit anyway. On the way back to port we did an annoying stop at a cameo factory – using shells that came mostly from South America (!) We’re not big fans of stop-offs for the sake of shopping so it wasn’t really our thing, but some of the passengers clearly enjoyed it and were purchasing. 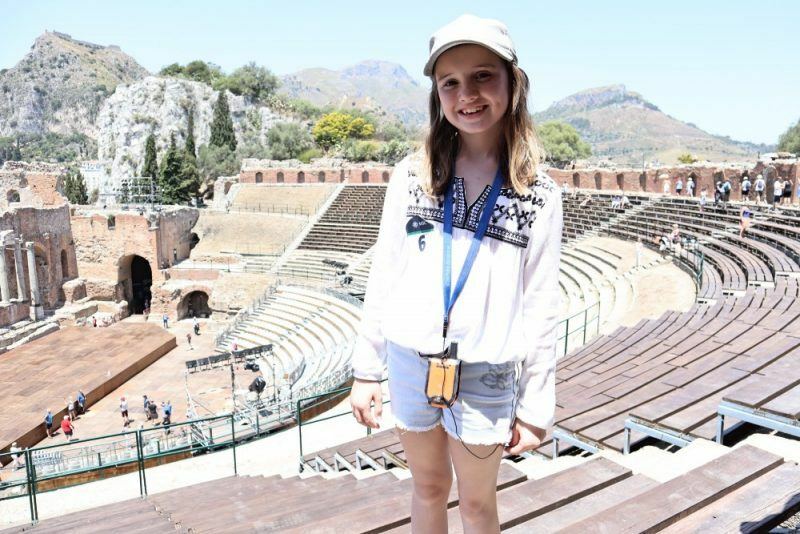 In Sicily we berthed in Messina – an ok port city, but we had been recommended to visit Taormina which was more pretty and had an ancient Greek theatre. We mainly booked the transfer excursion because of the distance away – 45 minutes, so we were a bit worried about seeing what we wanted in the short amount of time and making it back to the ship. 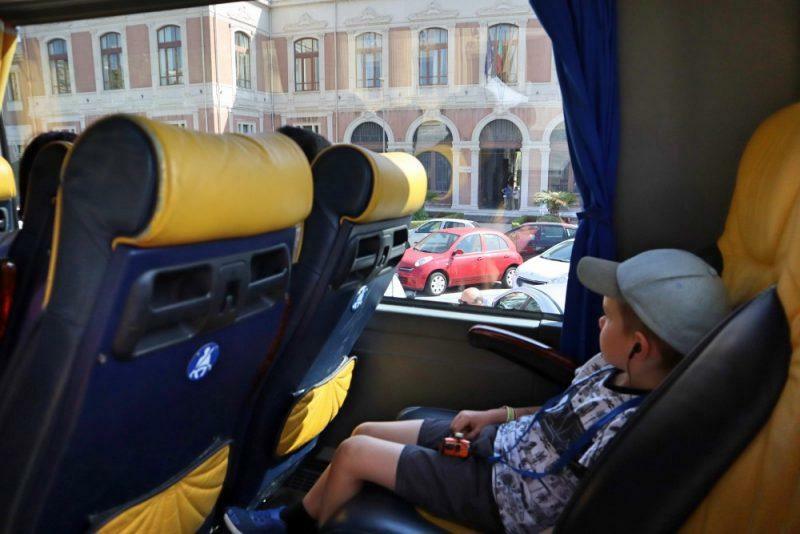 Aboard the bus to Taormina. 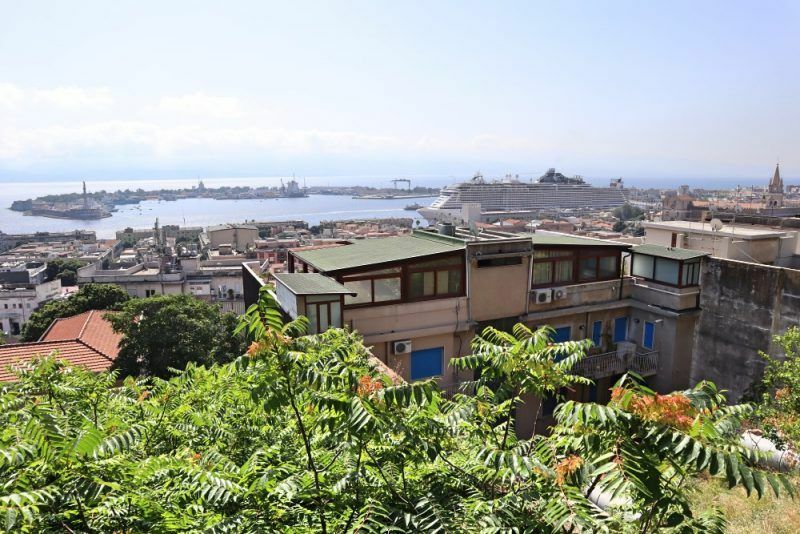 The drive to Taormina took us down the the Sicilian coast, with great views and also interesting commentary from our Italian guide keeping us entertained on the journey. 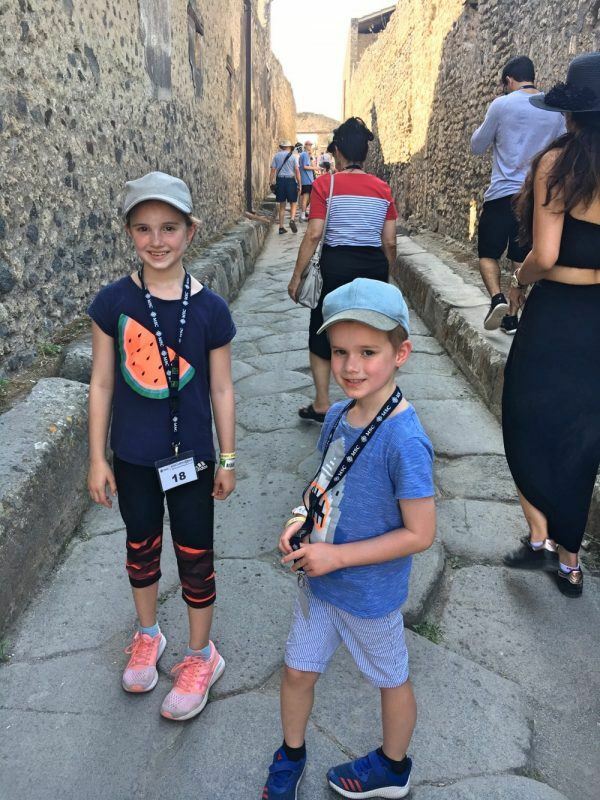 We exited the bus at the bottom of the town and then had a guided walk through the very pretty town, heading along the Corso Umberto, taking in the numerous piazzas and streets as we made our way to the Teatro Antico di Taormina – the ancient Greek theatre at the top of the town. Entrance to this site was included in the tour, and it gave us a spectacular view of the bay – definitely worth the 1.5km walk! Along the way we had time to stop for a very good gelato, and once we had reached the ancient theatre, we then had an hour or so to work our own way back to the bus at the bottom of the hill. 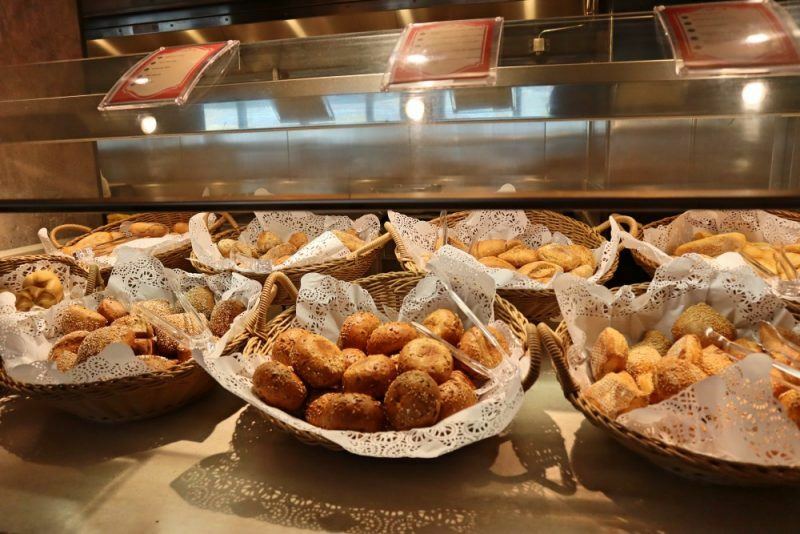 We filled in the time easily with a little shopping and managed to try a couple of delicious arancini (deep fried stuffed rice balls) from Antica Rosticceria da Cristina, just down from Piazza Duomo. The remaining ports we did our own thing. 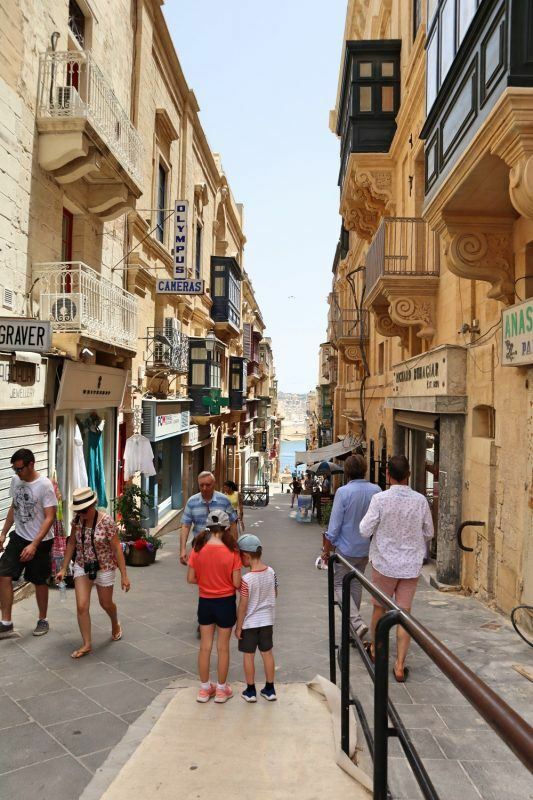 We stepped off the ship straight onto a hop on – hop off bus that took us to Mdina and then back to Valetta with plenty of time to spare. This cost us 30 euros (kids were free) instead of paying much more for an excursion – we actually saw many of our shipmates while we were out and about. In Barcelona, we anchored at the cruise port Terminal A which was around a 30 minute walk to the beginnings of the city and tourist area. Rather than paying the transfer bus through MSC we walked 10 minutes over the bridge to the port and got an Uber, probably saving us 50%. Again we had ample time to explore the city on our own. 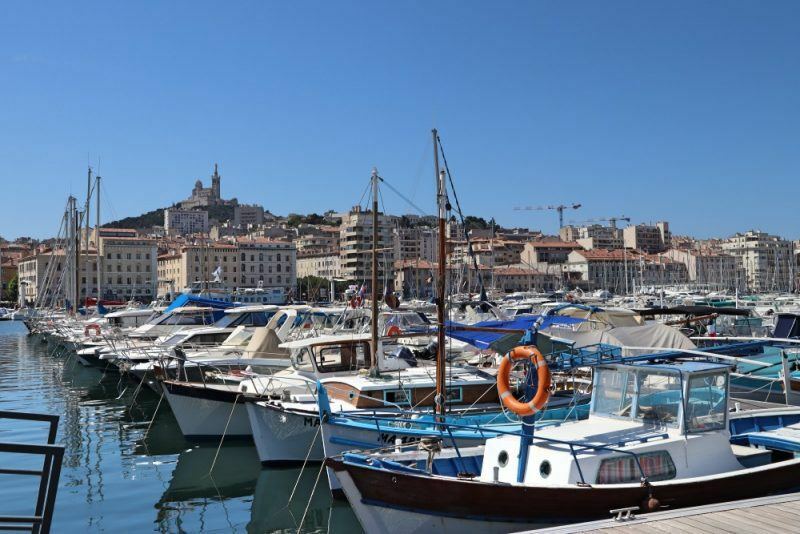 In Marseilles we were even further away, around a 20-minute drive from the city centre, so we took the MSC transfer which cost 50 euro for the 4 of us. 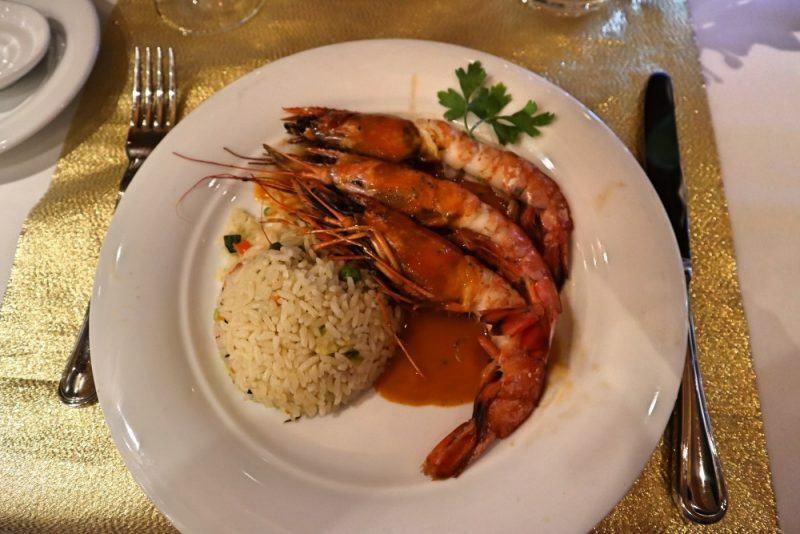 As we had visited Marseilles before, we chose to go and have a long lunch at Chez Fonfon just outside the city centre and experience some amazing bouillabaisse, the famous dish of the region. 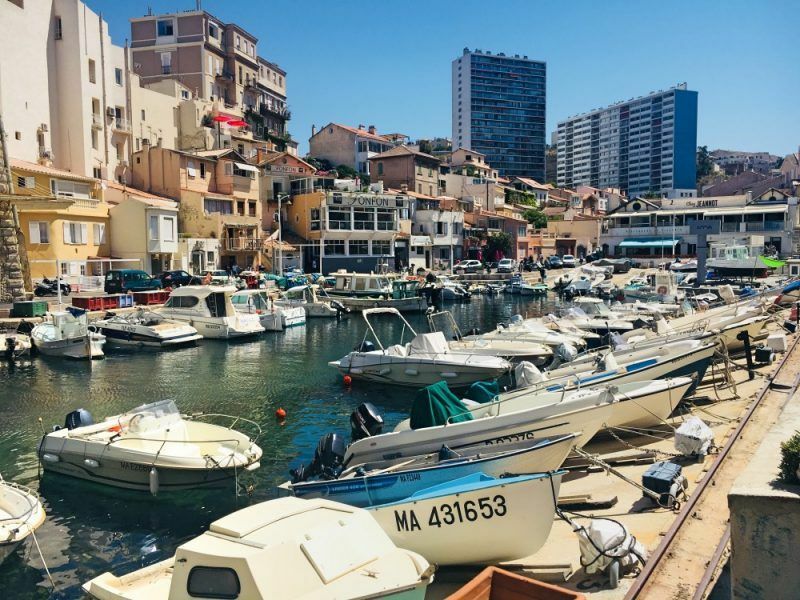 The pretty inlet in Marseilles where Chez Fonfon is based. 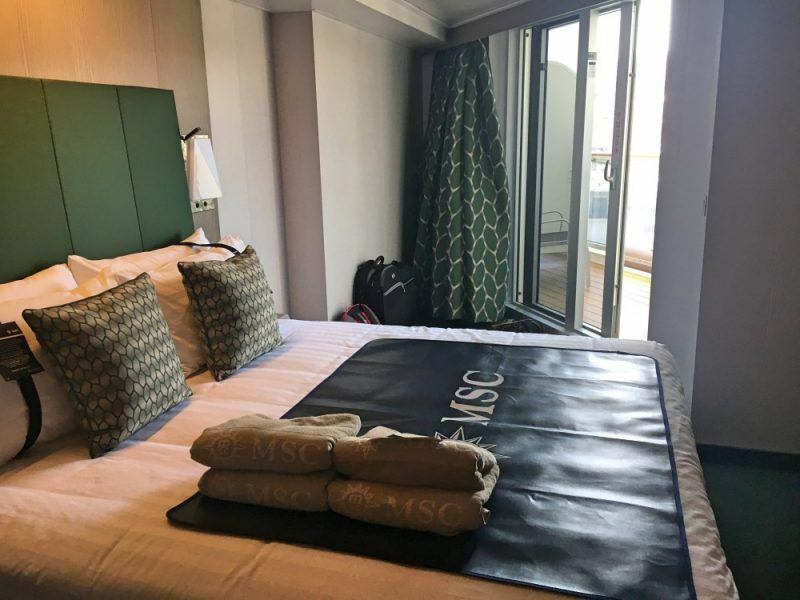 There was a lot to like about our MSC line cruise on the MSC Seaview and overall we were very happy with the ship, facilities, quality of food and the itinerary. The ship is absolutely in top condition given that it is brand new, and the fit-out is something else, we could not fault it. 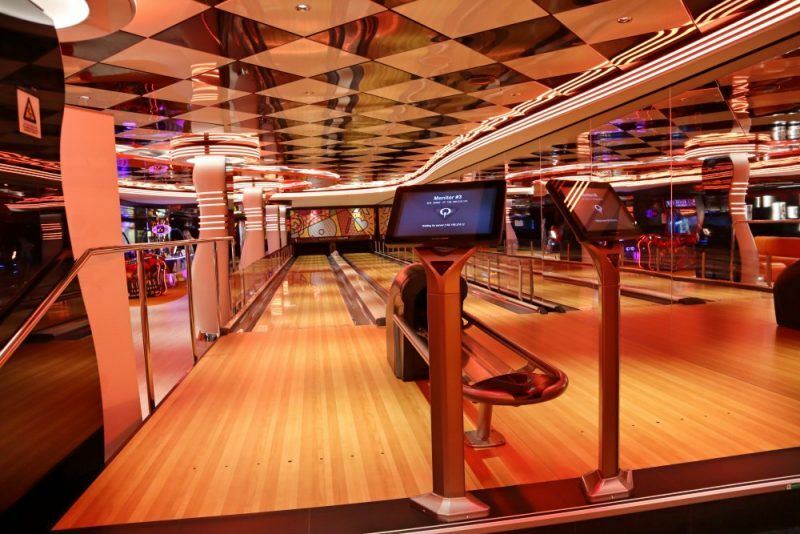 It definitely had a luxury feel about it and as first-time cruisers we really enjoyed it. Overall the staff were very helpful and friendly. We were pleasantly surprised by the spacious size of our cabin, and the housekeeping was excellent with twice daily serviced room. 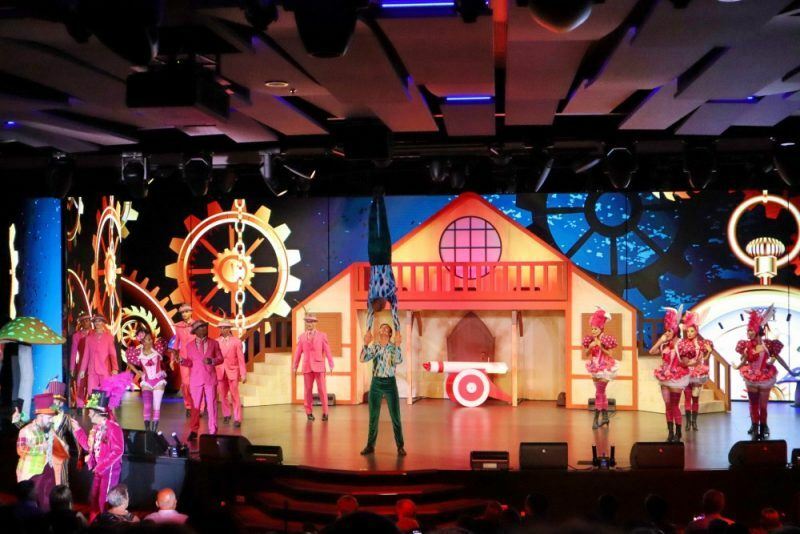 The facilities were great – in particular the Treehouse adventure/splash pad/waterslide area was fantastic and what you’d expect from a top notch water theme park let alone a cruise ship. Exploring the ship was so much fun! We really enjoyed the shows we watched, the style was pitched really well and just long enough to hold our kids’ attention. 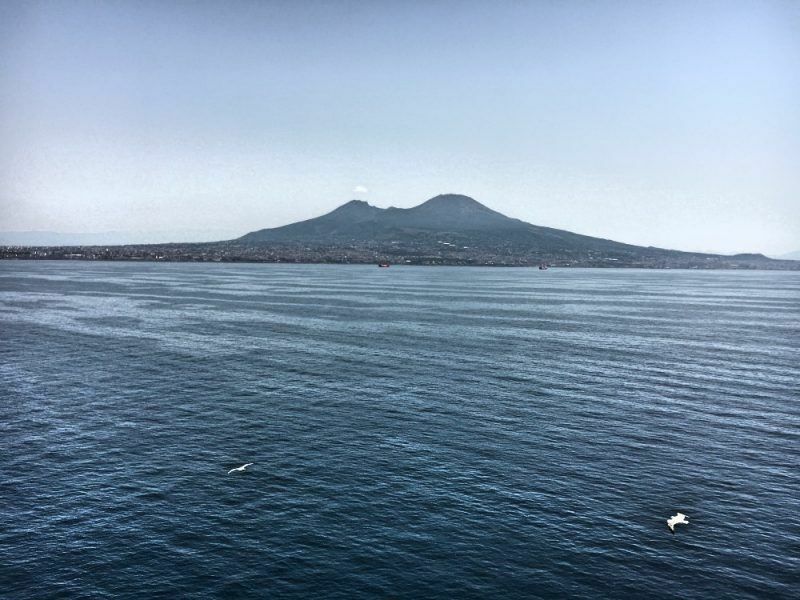 We loved waking up each morning coming into a new port – to see a new destination from the water was really quite spectacular and quite different to flying in to an airport or coming via a smelly bus or train station. 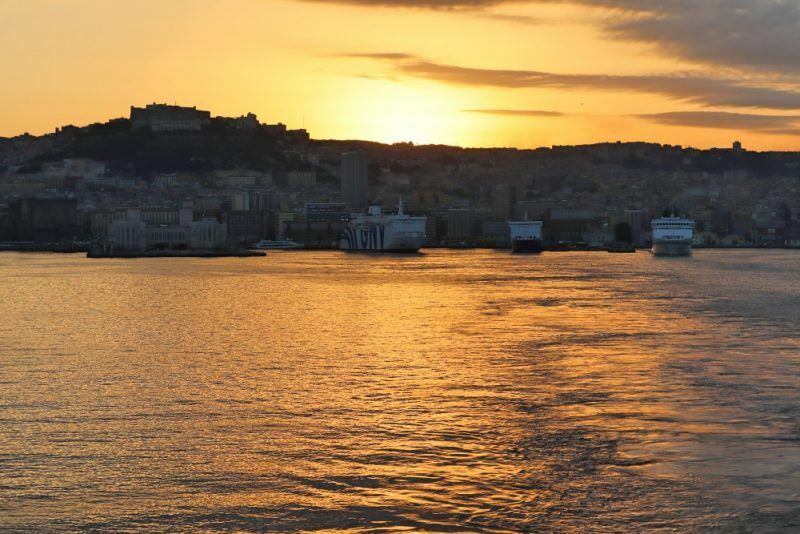 Arriving and leaving ports like here at Genoa was simply spectacular. Embarking on and off at ports was a relatively straight forward and easy process – we had been warned by others that there is a lot of queuing when you’re on a cruise but we found it surprisingly straight forward and well managed (other than the Naples/Pompeii excursion but to be fair there were 18 bus loads of people to get off the ship at once). Security was excellent and we always felt safe. Bags were scanned every time we embarked and we walked through metal detectors, as well as our photo ID on our cruise card being checked each time. 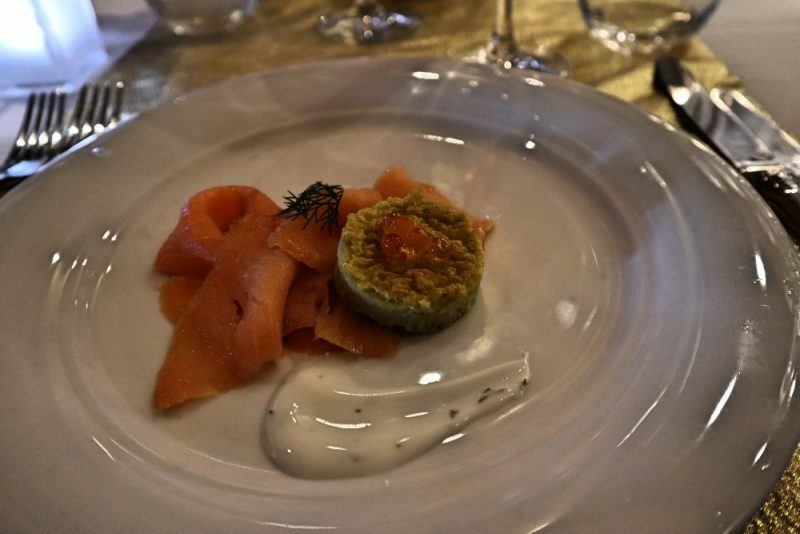 The food was wonderful – a great variety of choice – you could be as healthy or gluttonous as you wanted! 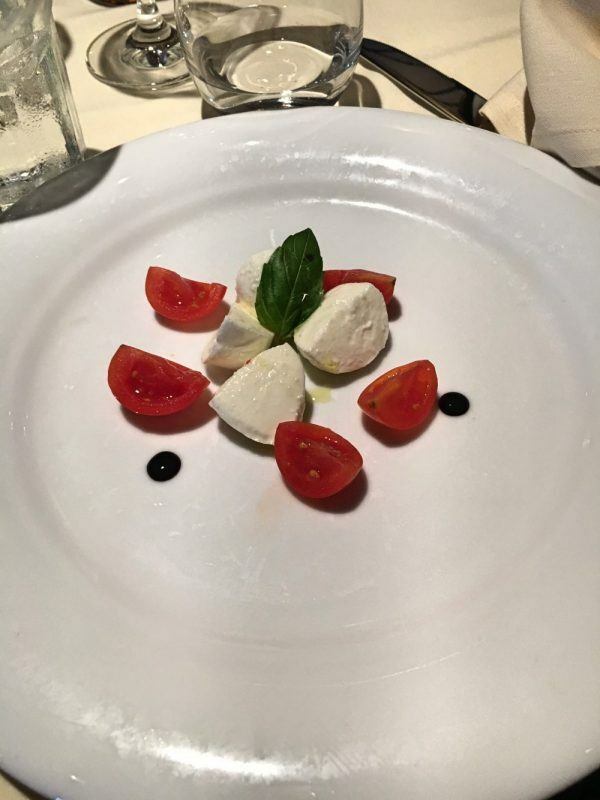 It really exceeded our expectations and we enjoyed all of our meals. 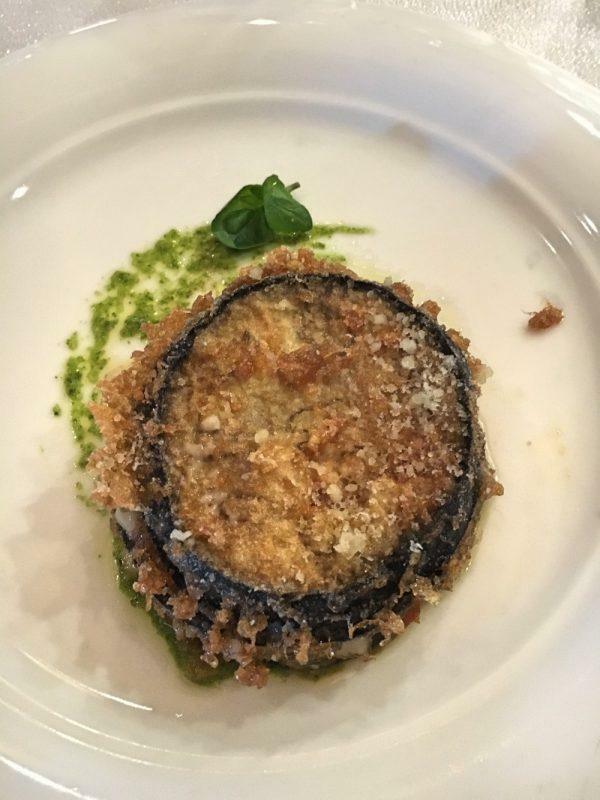 The food like this delicious aubergine and pesto was great! 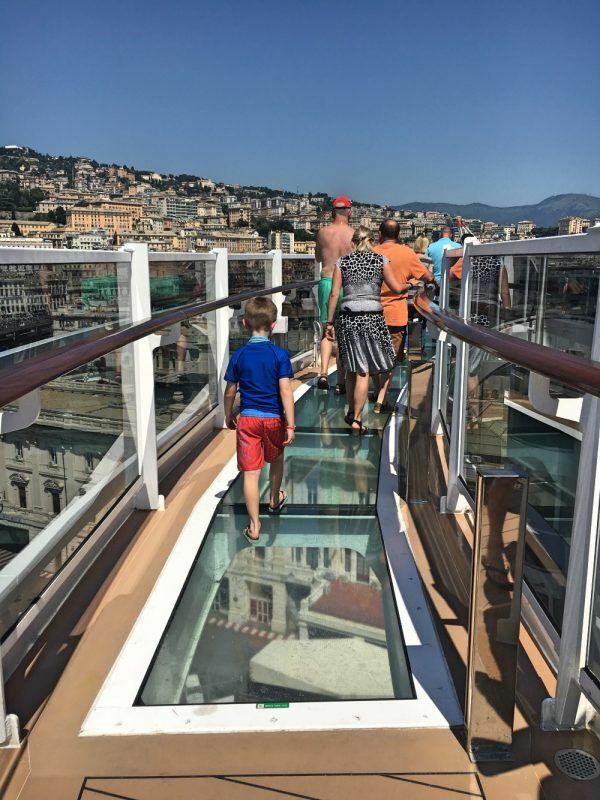 On reflection, we feel our cruise was actually reasonable value for money given that it included travel to the destinations, accommodation, food and entertainment. While it seemed a lot of money when we paid the balance months ago, on reflection it’s on a par with previous trips where we have done similar travel but independently. The itinerary was great – we found seven nights to be enough and the destinations we visited were all interesting. Please note: These are extremely picky points as overall we were very happy with our experience. However at times, the ship did feel a little crowded particularly on the at sea day and early mornings and evening when trying to get around for excursions. The buffet restaurants were crazy on the at sea day and it almost felt as if they needed to stagger the service times. At peak times it was sometimes difficult to get an elevator as they were always crowded – a positive is taking the stairs helped us to walk off some calories from all that delicious food! However for those who are less mobile it could be a problem. The cost and need of transfers from the port in Barcelona and Marseilles perhaps could have been highlighted earlier – this was effectively another 150 euros worth of cost for four people that we hadn’t budgeted for (if we had opted to use the Barcelona transfer rather than getting our own Uber). 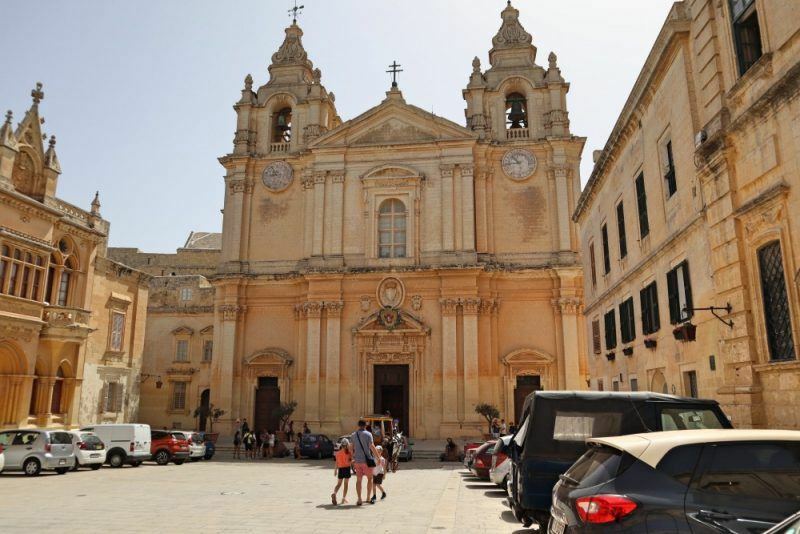 Similarly there is a daily service charge of 10 euros per adult and 5 euros per child that’s added to your bill, that you receive on the last morning. We found the service to be very good on-board and as it was in lieu of tipping we were happy to pay. However this information is buried quite far down in the terms and conditions of your booking – we were aware of it prior – but we feel like it could be better if MSC were more upfront about it as it feels a bit like a hidden charge. Finally we thought the kids menu in the main a la carte restaurants could have perhaps been a little more adventurous. Our kids got bored of the choice of a hot dog or hamburger so we ended up eating more often in the buffet where they could indulge in mozzerella, a variety of salami, olives, salad and fruit bar, octopus, and patisserie style dessert (rather than a bowl of ice-cream with sprinkles) – basically all the things we have to pay a fortune for at home in New Zealand so they don’t experience very much. To be fair though they are relatively adventurous eaters, so the standard kids menu probably works for the majority of children. We had a fantastic trip on the MSC Seaview and overall really enjoyed ourselves. It made for an easy holiday – unpack once for the week and not have to think too much about logistics of visiting four countries in a week. 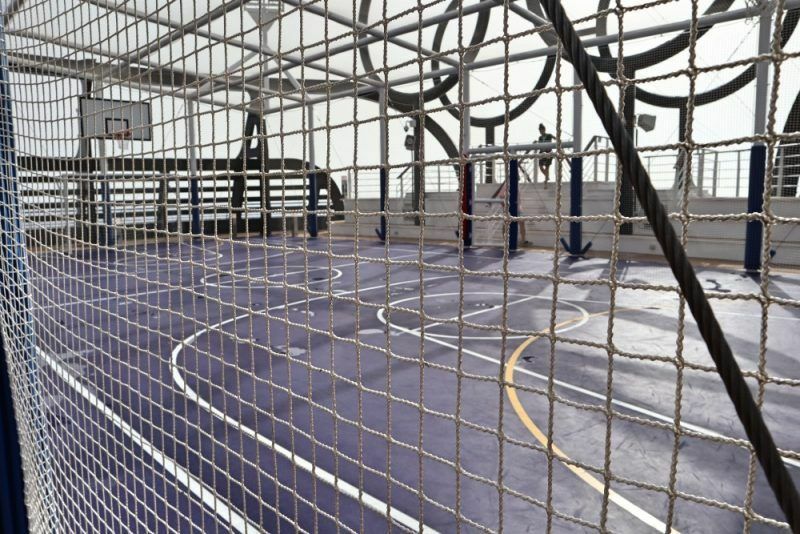 The facilities were fabulous, truly top-notch quality and we had lots of time together creating some wonderful family memories. 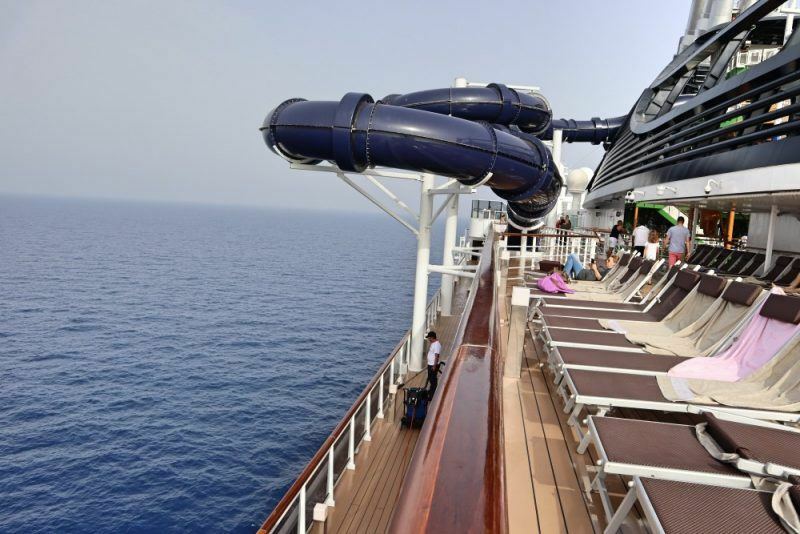 As first-time cruisers, we can see why people love it as a holiday option. 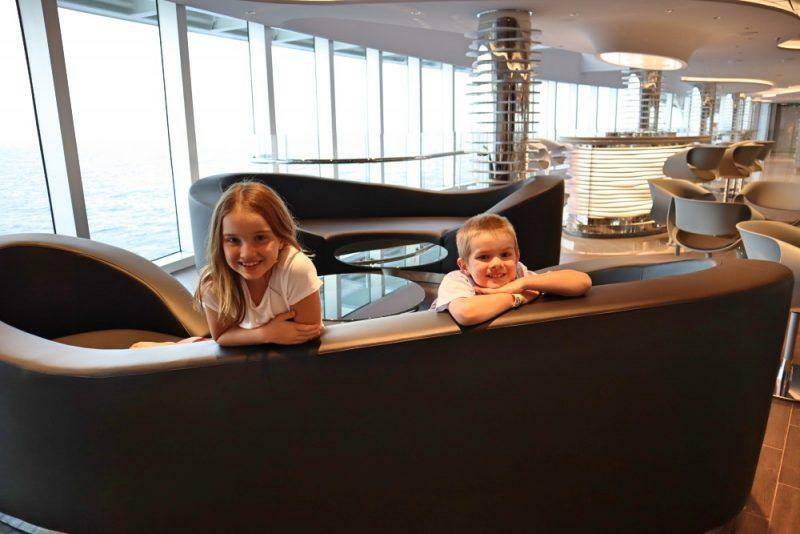 Is it the best MSC cruise ship for families? Quite possibly yes due to its amazing facilities and elaborate interiors. Every time we saw the ship from port we kept commenting how massive and extraordinary it was, so from that perspective it was really great to experience what it was like sailing on a mega-ship. Would we do it again? In a nutshell perhaps, although it is a hard sell for us given our history of more independent, slower travel. We really do like doing our own thing a bit more and having the time to really explore a destination in-depth rather than only for a few hours. However if you only have limited time, want a hassle-free fun family holiday then we’d highly recommend it. Keep an eye our on the MSC website as they often advertise great MSC cruise specials and the MSC cruise prices can have big discounts (including MSC Cruises 2 for 1 deals or MSC Cruises last minute deals). There’s a wide range of MSC cruise destinations – after a summer in Europe the MSC Seaview is heading down to Brazil! 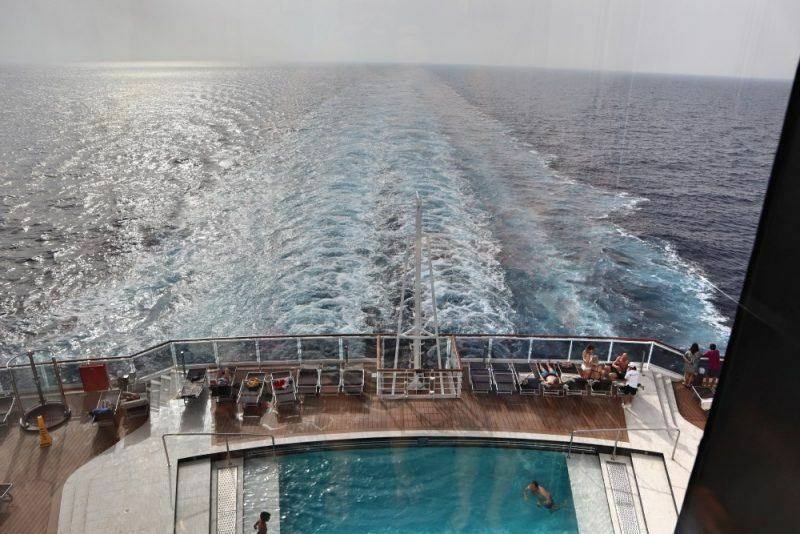 I think that the MSC cruise was really fun and cool. I really liked all of the shows and the pools. My favourite thing to do in the pool was the water slide. I liked all of them and we saw 2 really cool shows called Bizarre and Fantasia. I also liked the food it was really really good. 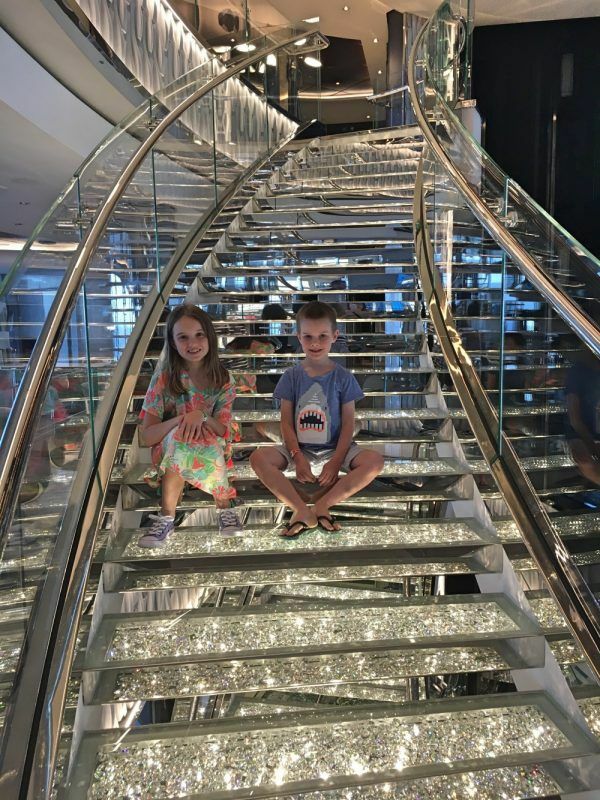 I loved my time on MSC Seaview cruise and definitely recommend it for any travellers with kids. Oh thank you so much Jo! Appreciate your comments and glad this helped! Looks amazing! And interesting to compare to the Meraviglia. I was shocked at those shuttle prices too! We found it substantially cheaper getting taxis so I didn’t really care in the end but they could try to not rip people off so much! We ordered normal meals for the kids in the main restaurants when they wanted them. I also was taken by surprise with the tips added. We have done a lot of cruises so are used to this from the US ones but I hadn’t expected it on an Italian line in Europe – they really should make that clear. Many years ago hubby and I got upgraded to a balcony cabin and it totally ruined me – they are so good! Fantastic review, thank you for sharing. We are on this ship next year and cannot wait. I’m glad you enjoyed it and found our review useful! You will have a wonderful time I’m sure, it’s truly a great experience! Thanks for this great and informative blog. Me, my wife and my 4 year old daughter sail on the Seaview next June and can’t wait! Thanks so much Iain! I’m sure you will have a wonderful time, it’s a great ship. Thank you for such a detailed review, we sail on Seaview in April and this has been really useful ! You’re so welcome, I’m sure you will love it, it’s a fabulous ship! Safe travels! Great review and very useful and informative comments. We will ride on this cruise this Sep and this is our first family cruise trip. May I know if we can bring snacks and drinks onto the ship when we take off to the city for sight seeing? Thanks a lot for everything you shared! Hi Florence, glad you found it helpful! I think if you had maybe one or two bottles of water and some small snacks that would probably be ok. What they are looking out for is people trying to get alcohol on board (because they will lose sales if people bring their own alcohol on board!) 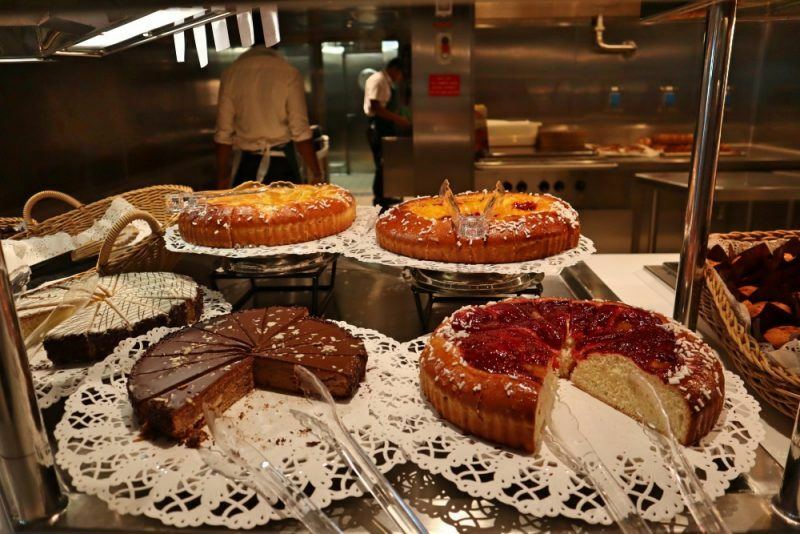 To be honest there is amazing food available around the clock from the buffet, and water always available, plus an onboard store selling snacks for reasonable prices so you wouldn’t need to bring too much on board with you. Hope that helps!